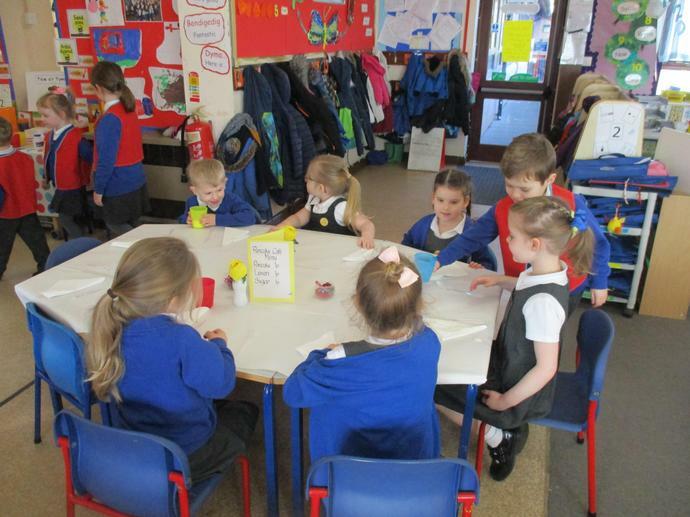 We would like to give Reception and their families a warm welcome and look forward to getting to know you all. 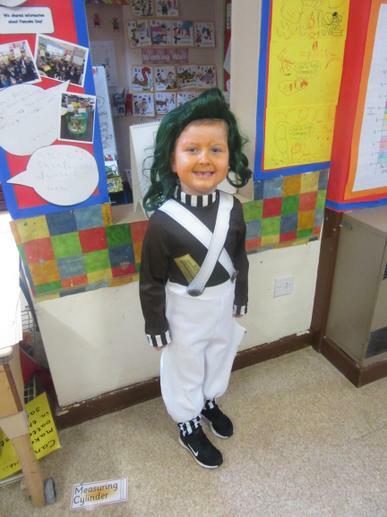 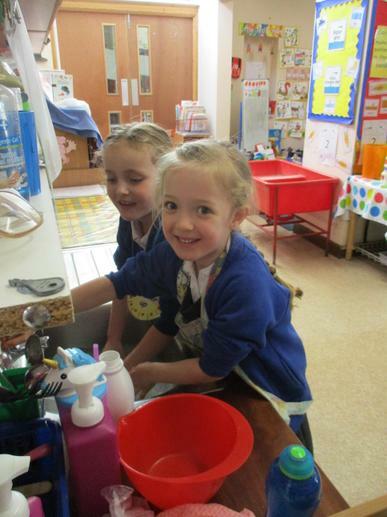 We hope that you have enjoyed your first few days in school. 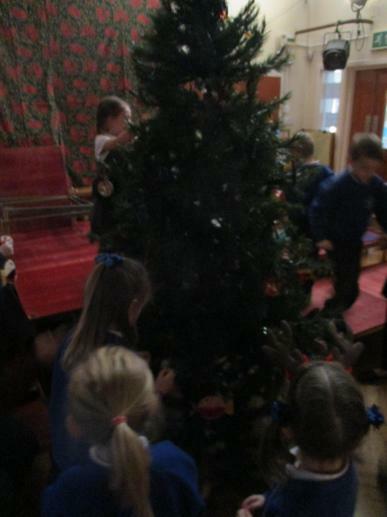 The children have settled in very quickly which is always a good start. 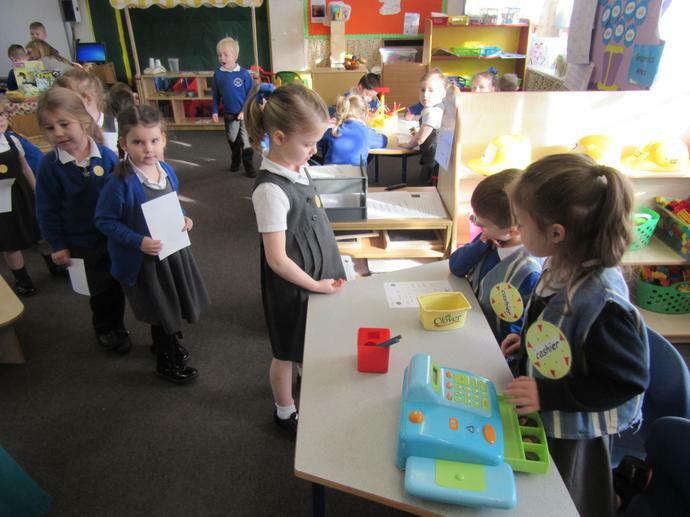 Just a quick reminder, from Monday 10th September Reception will be in school for the whole day. 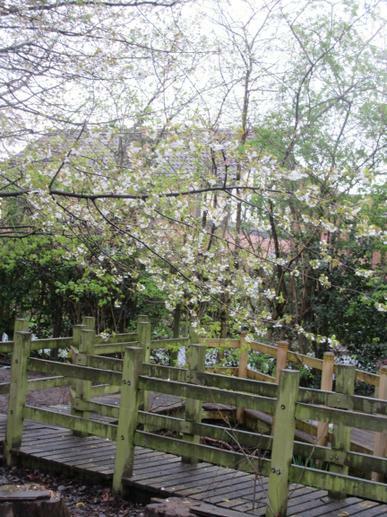 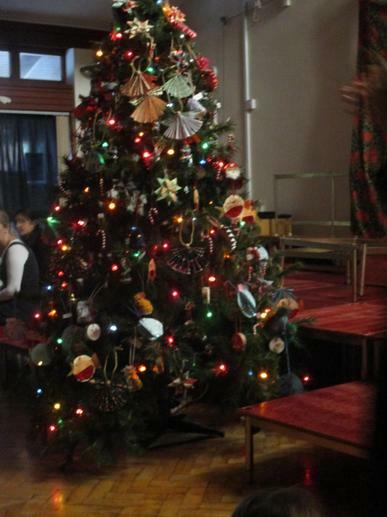 The school day will begin at 8.45am (morning bell will go at 8.55am) and the day will end at 3.10pm. 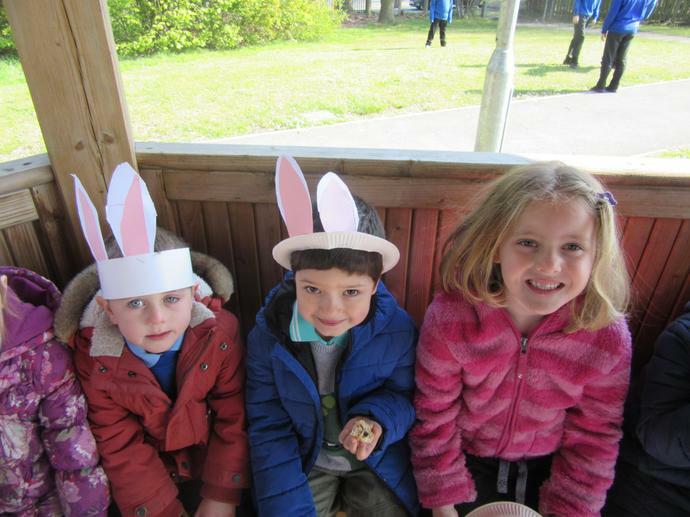 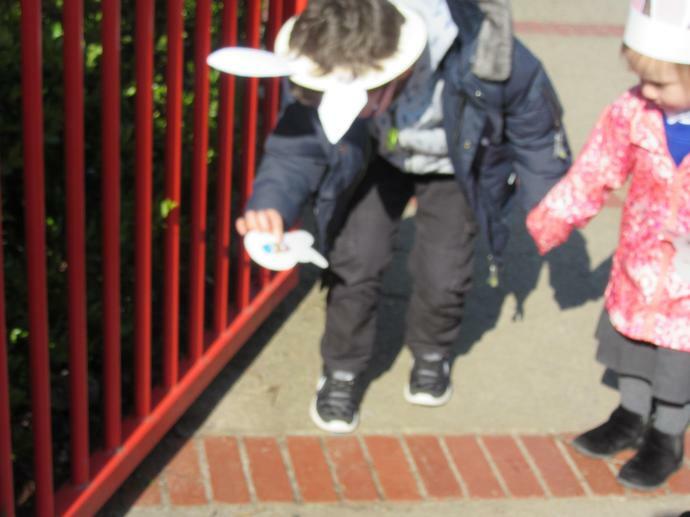 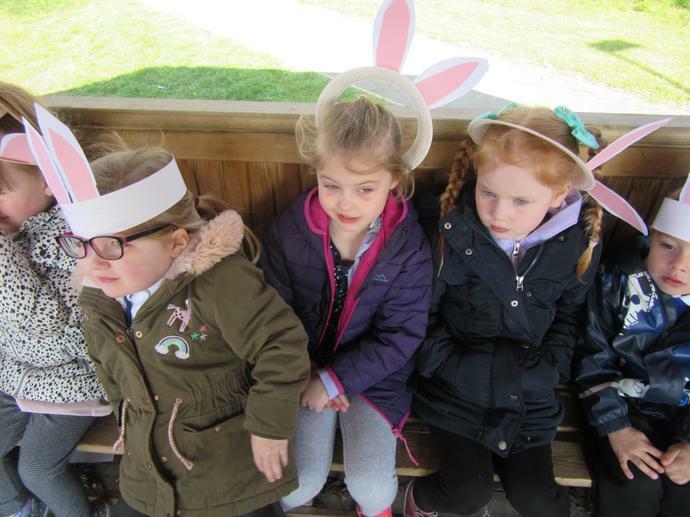 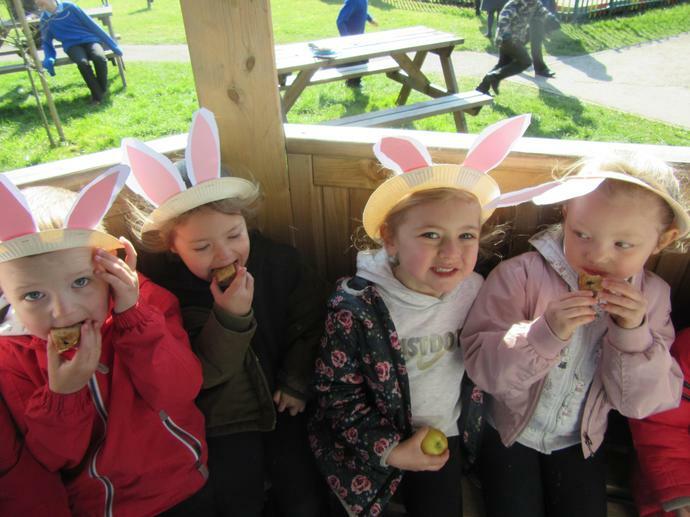 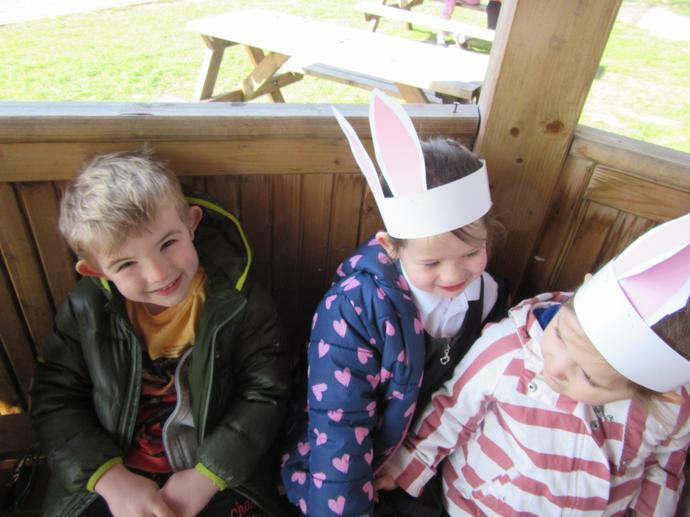 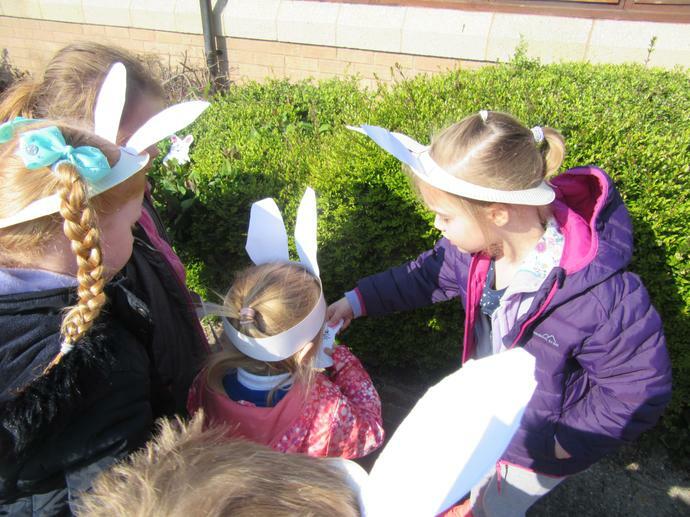 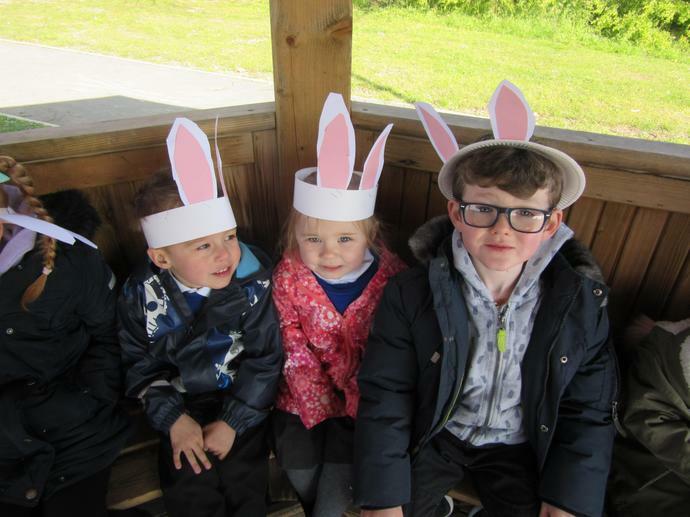 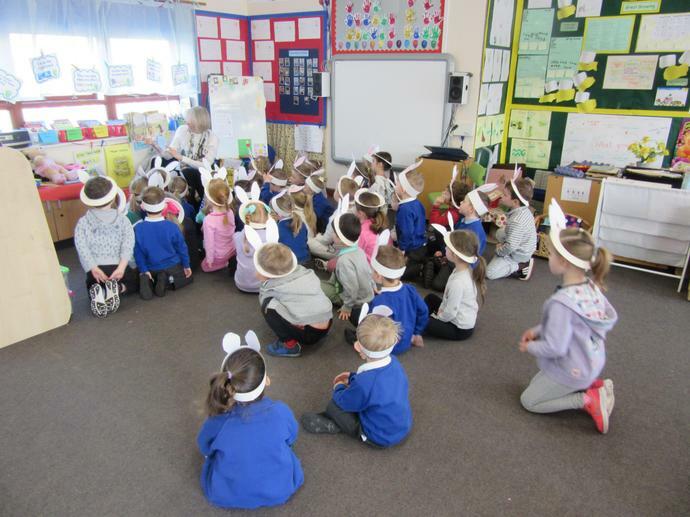 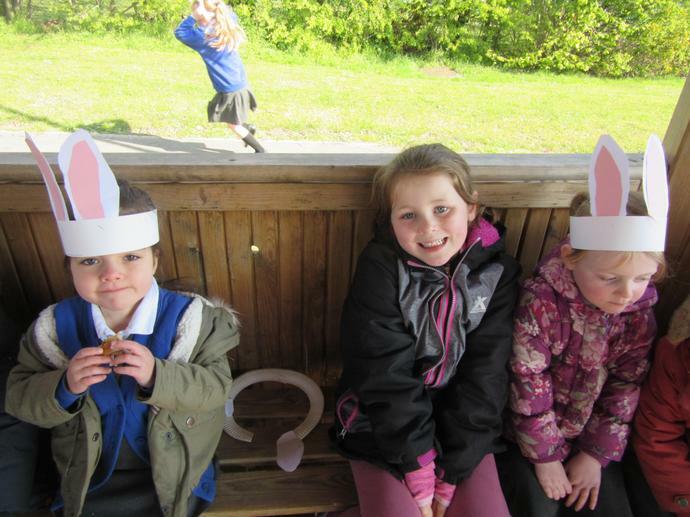 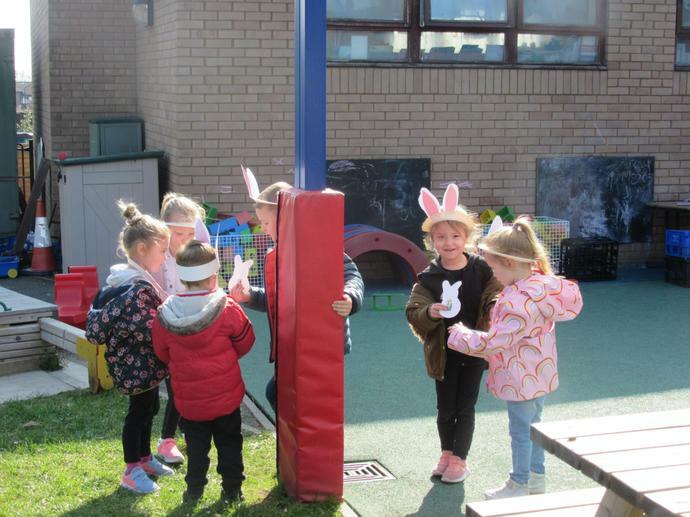 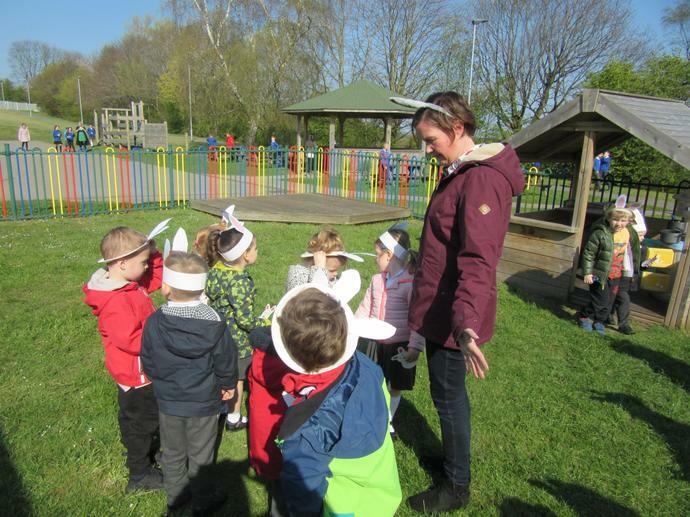 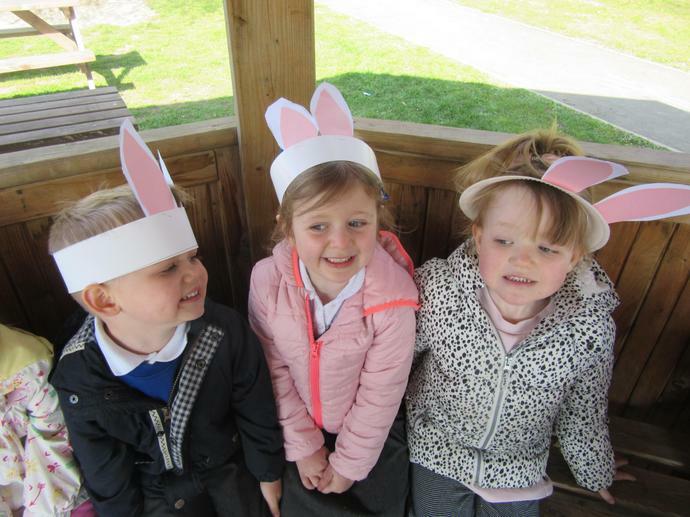 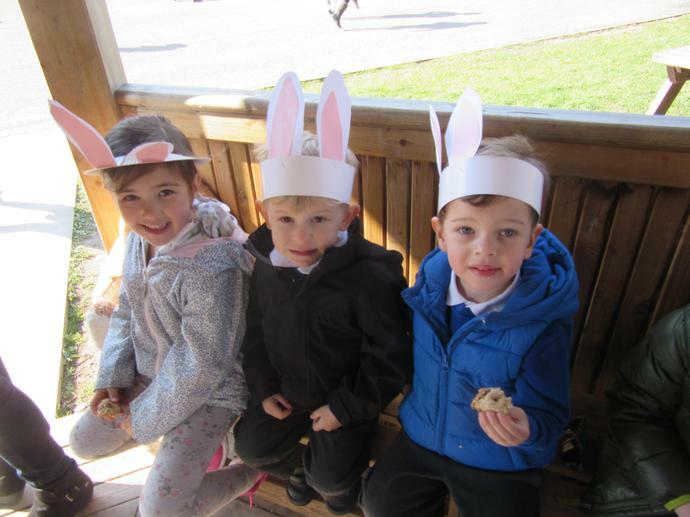 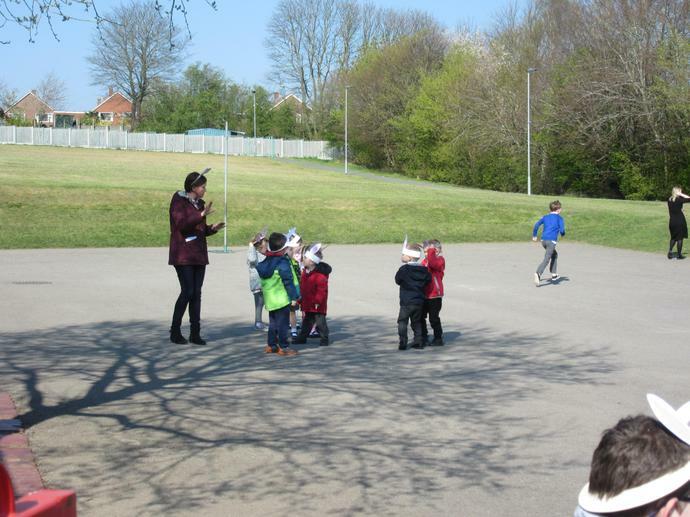 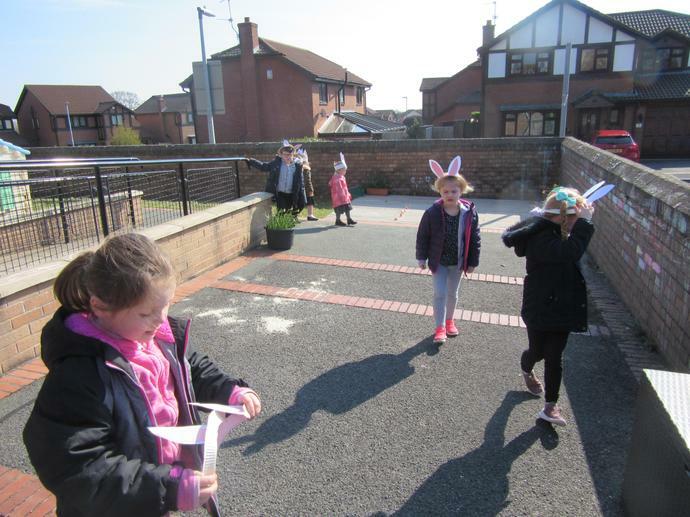 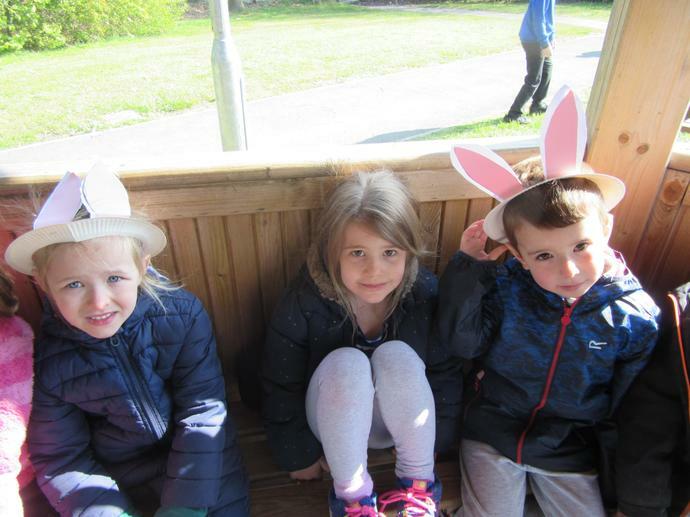 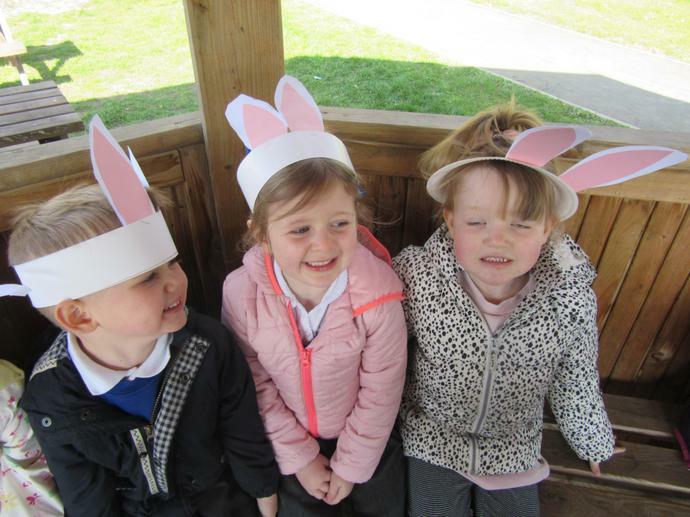 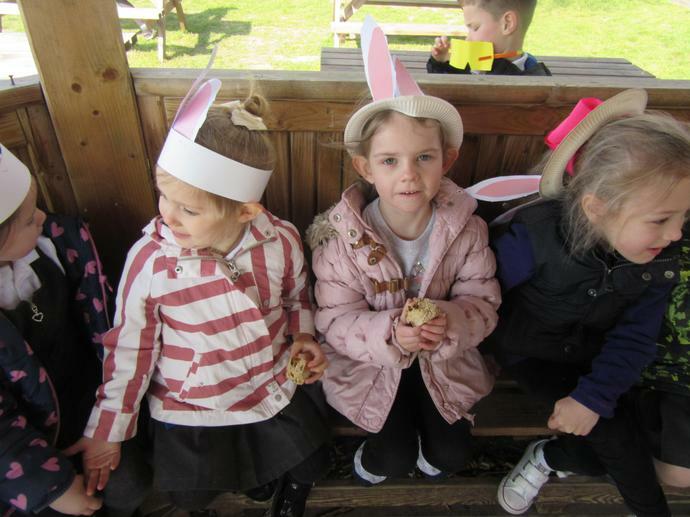 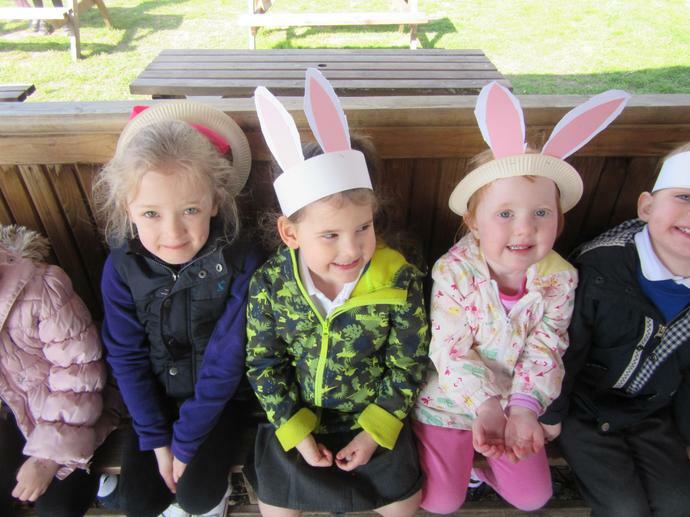 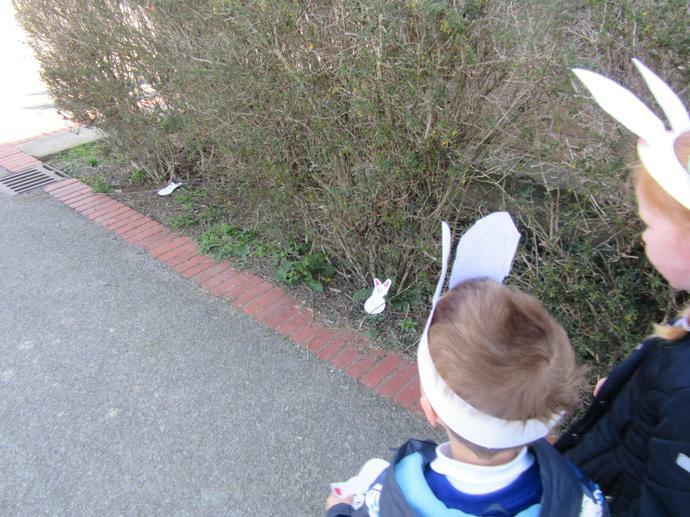 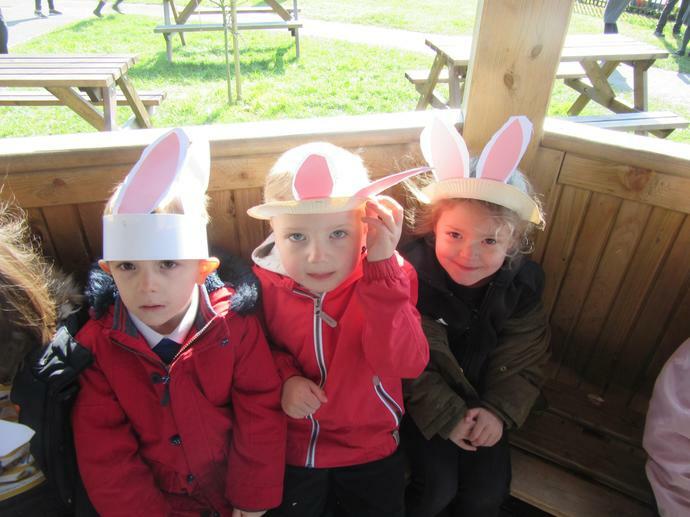 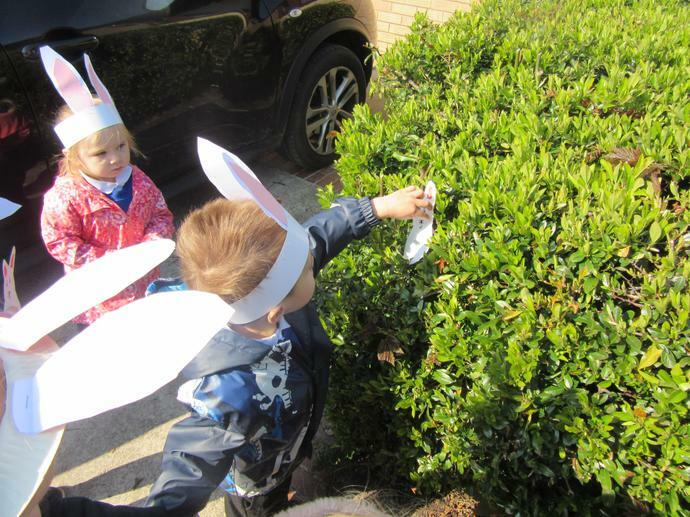 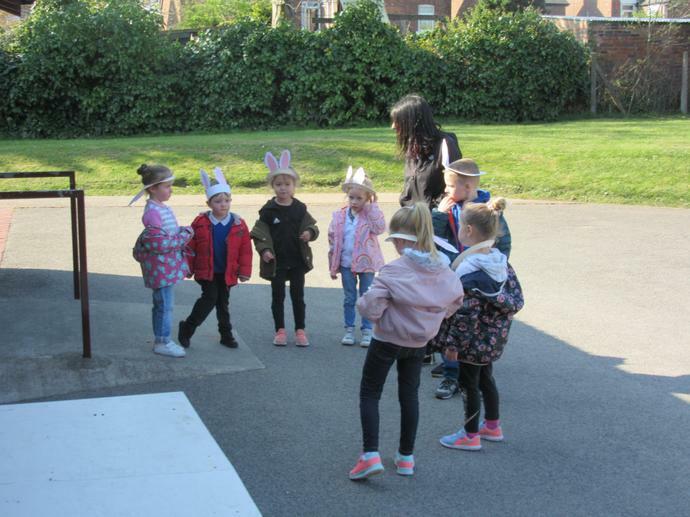 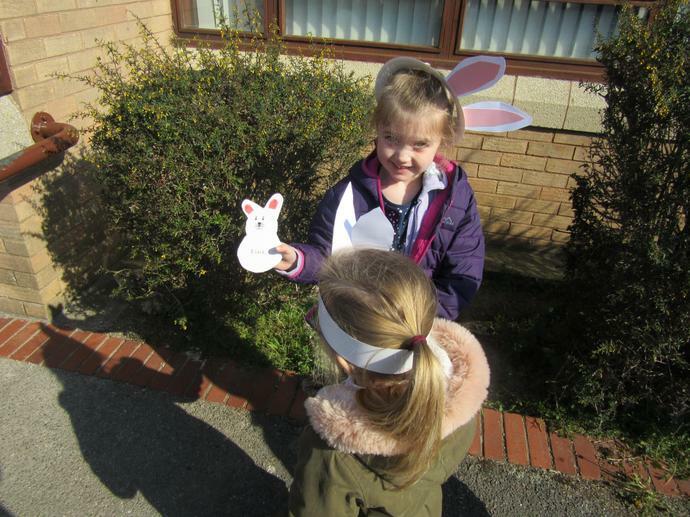 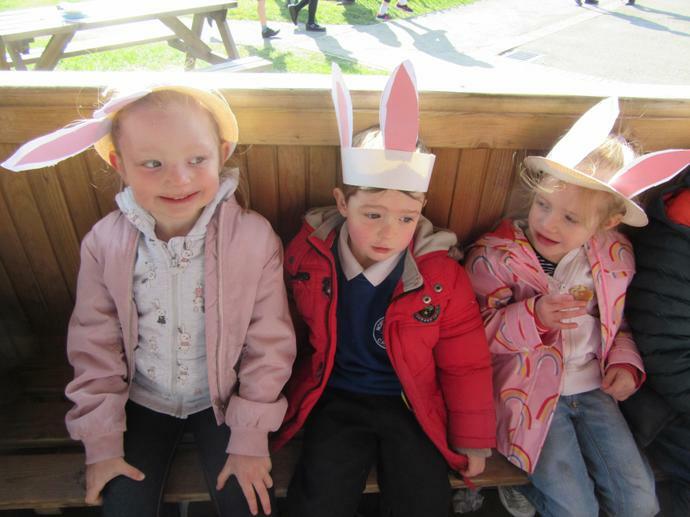 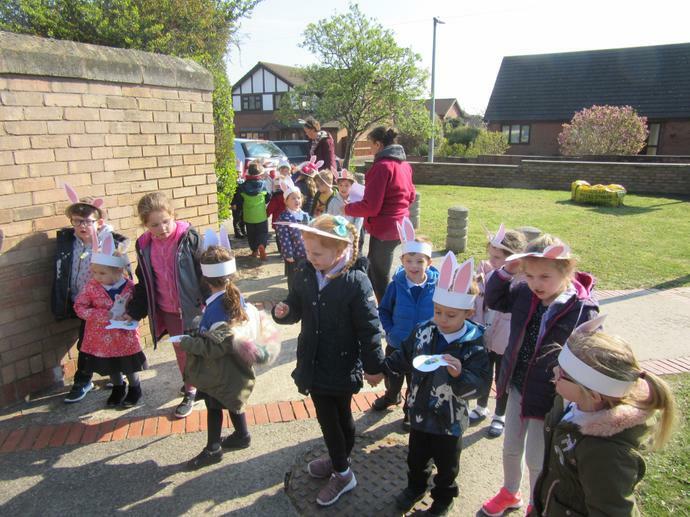 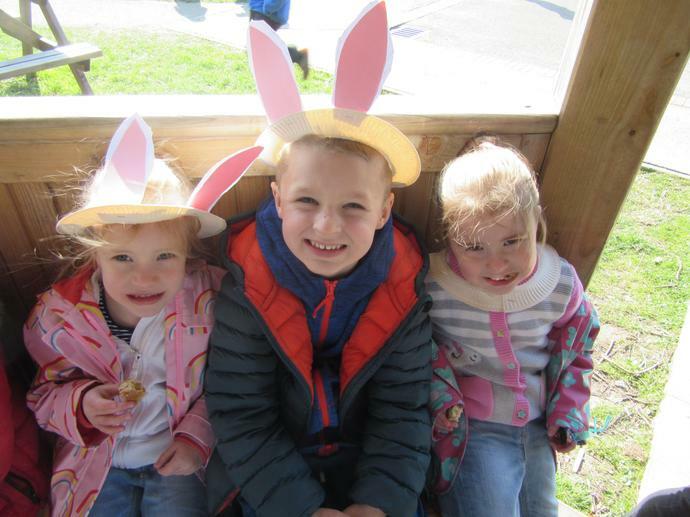 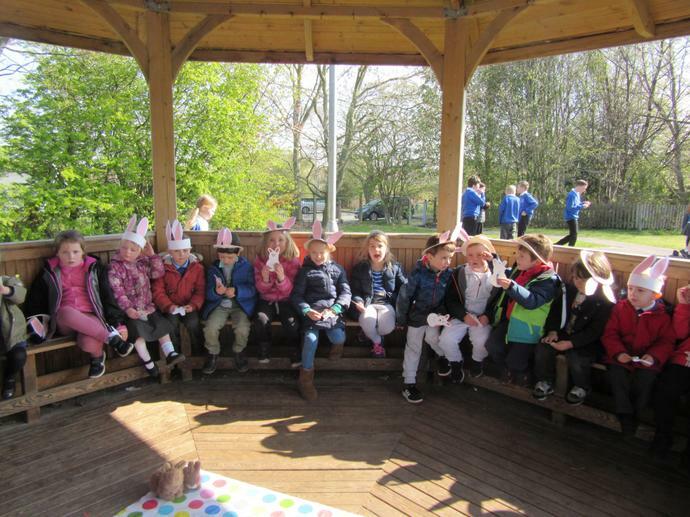 Reception have enjoyed going on an Easter Bunny Hunt with Nursery. 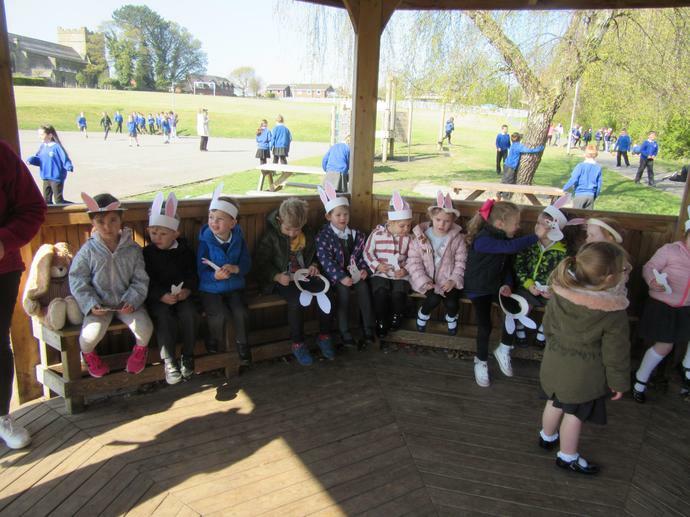 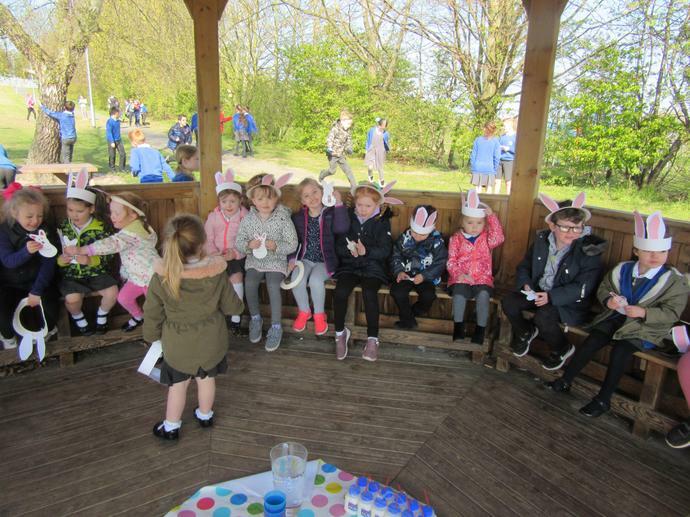 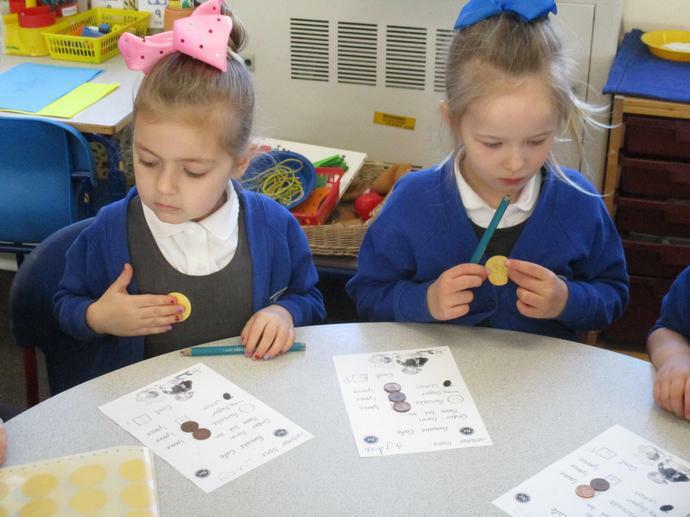 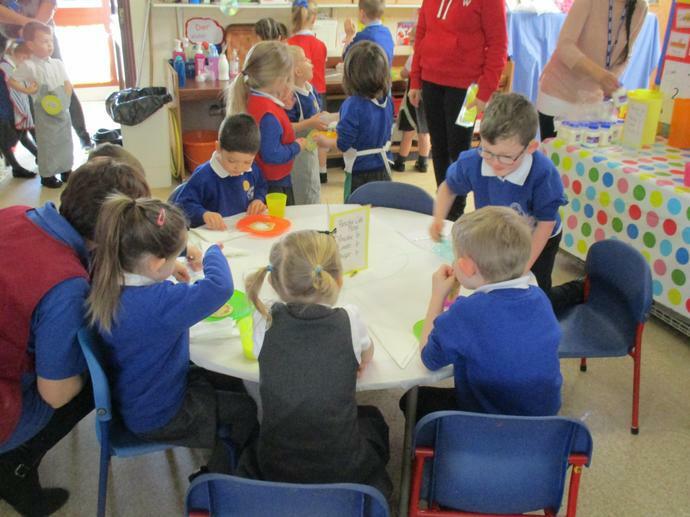 They were busy making hats with their partners, looked for their chocolate surprise, shared a snack and then joined in with singing some Easter songs. 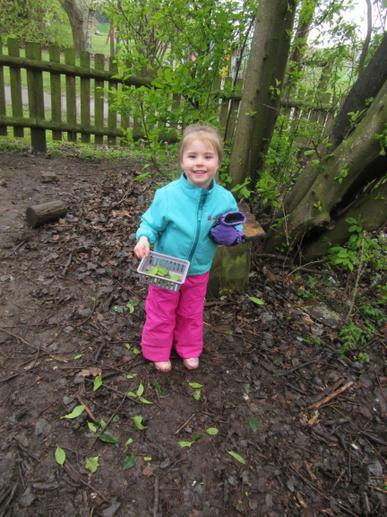 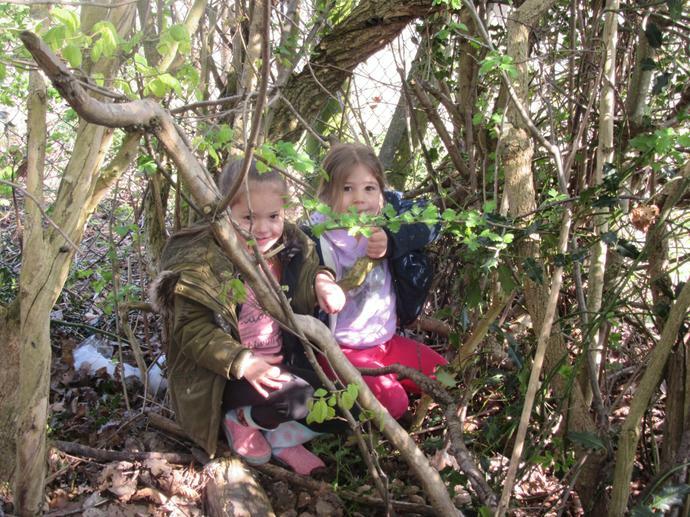 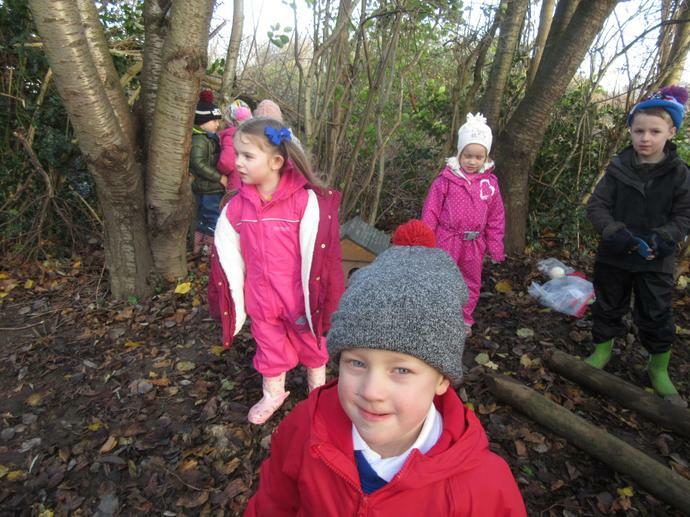 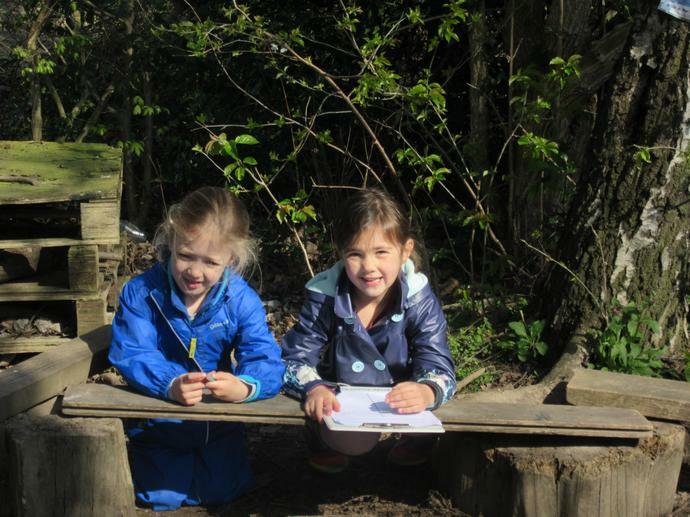 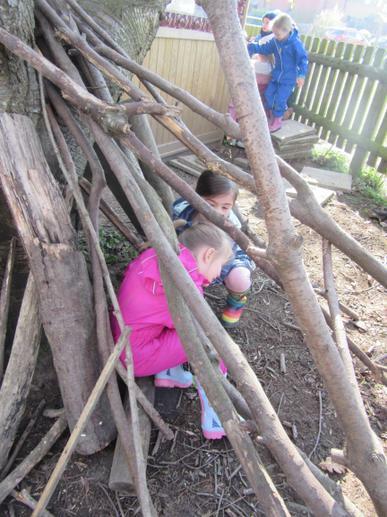 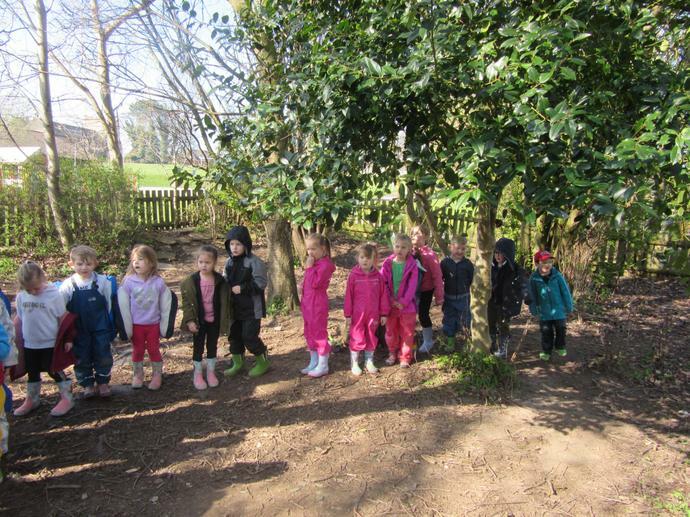 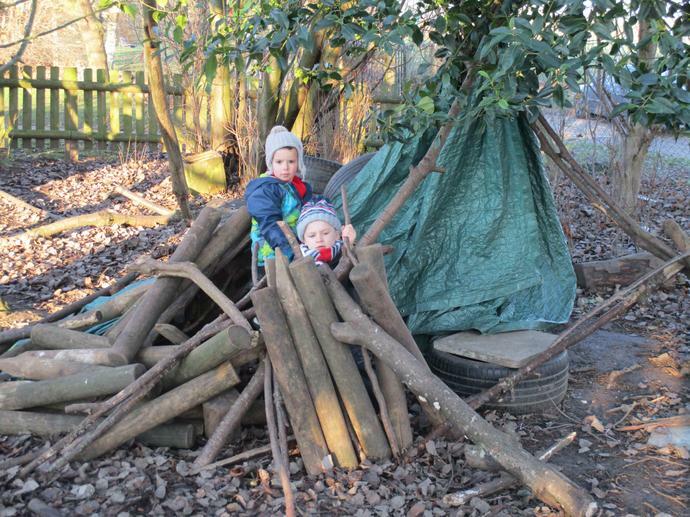 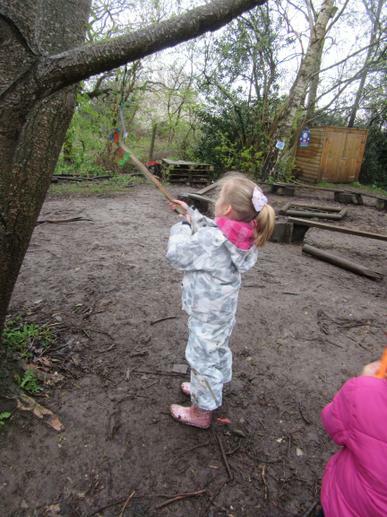 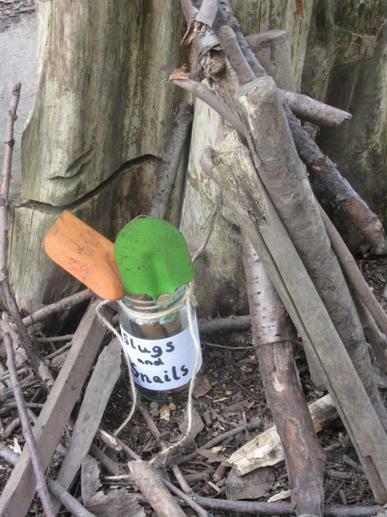 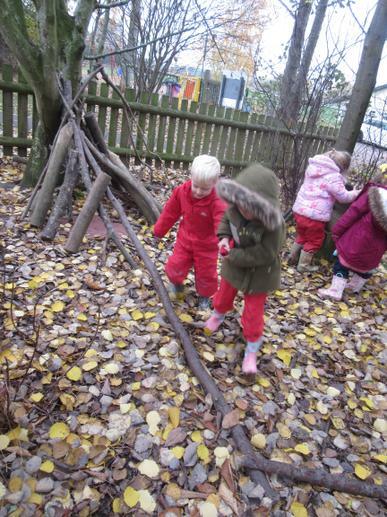 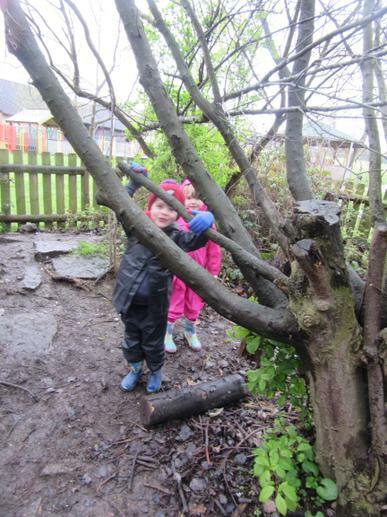 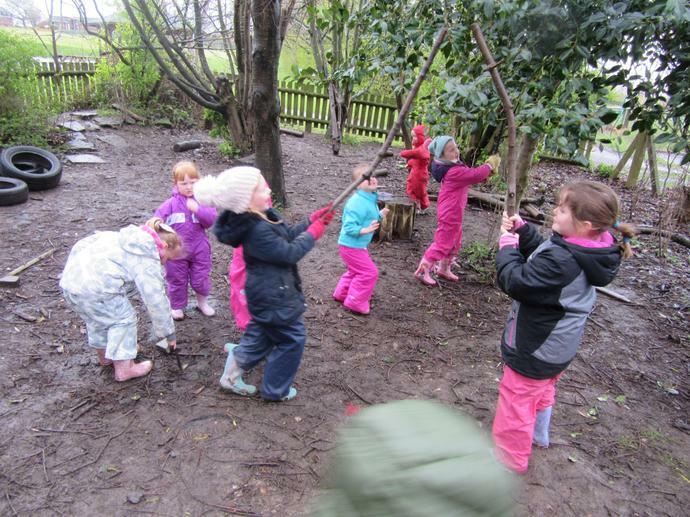 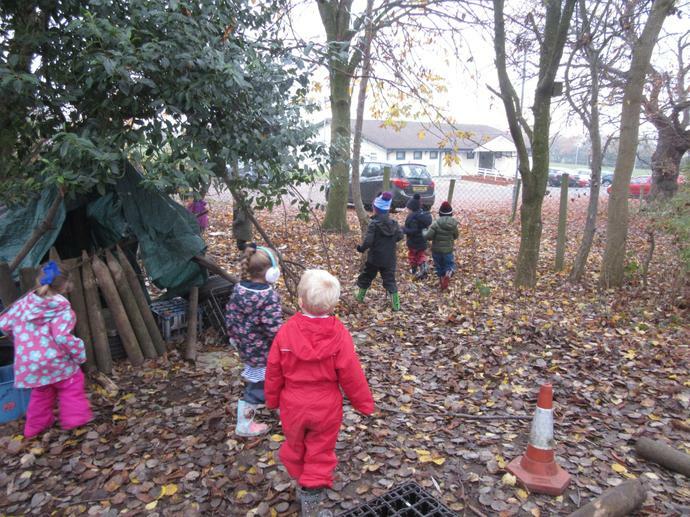 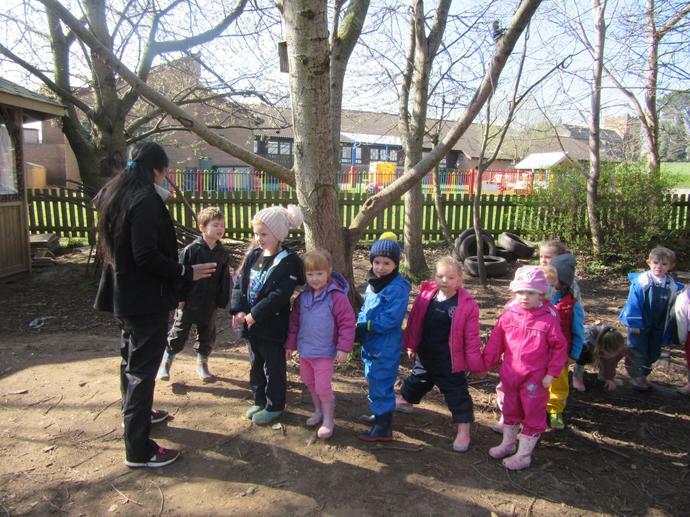 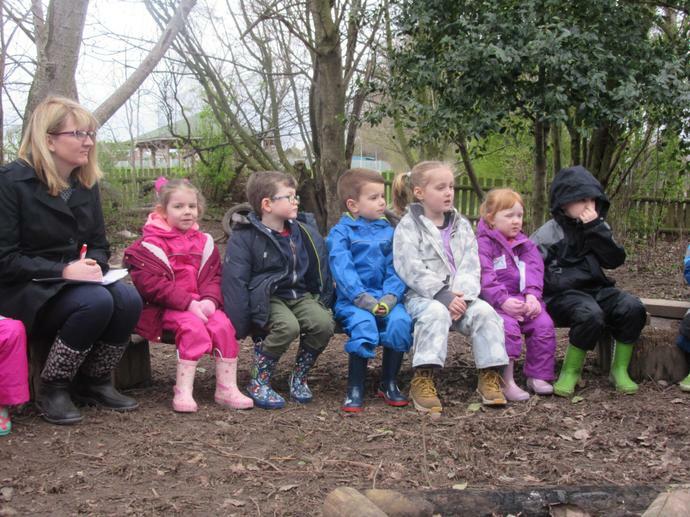 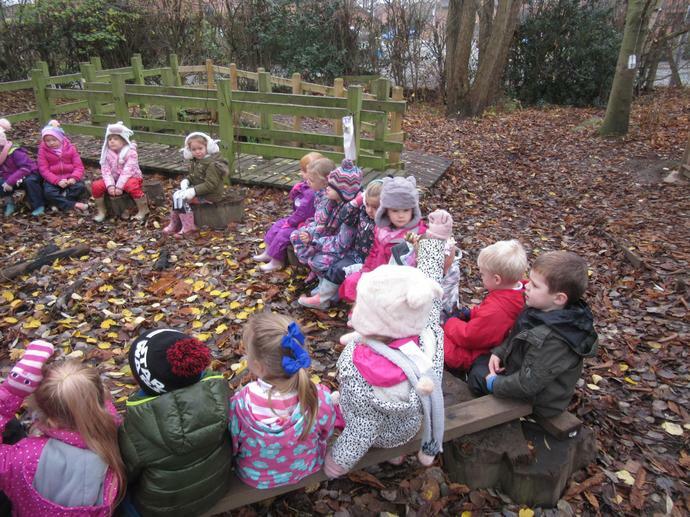 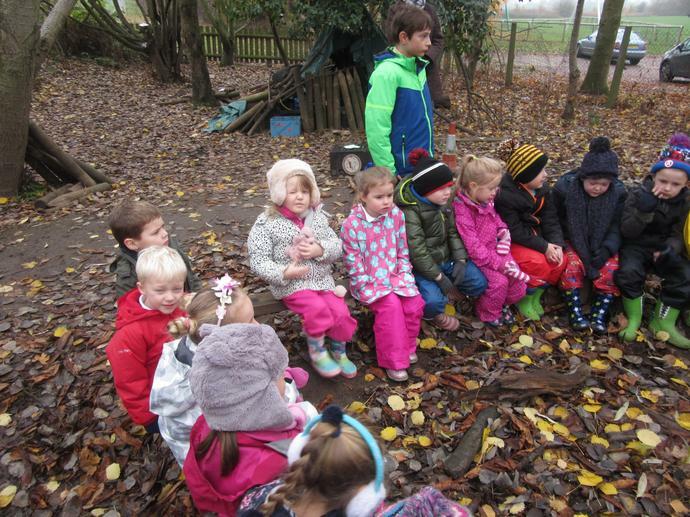 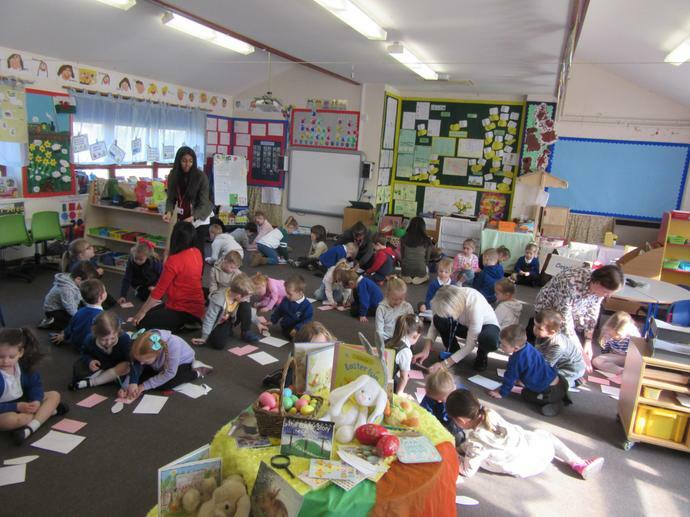 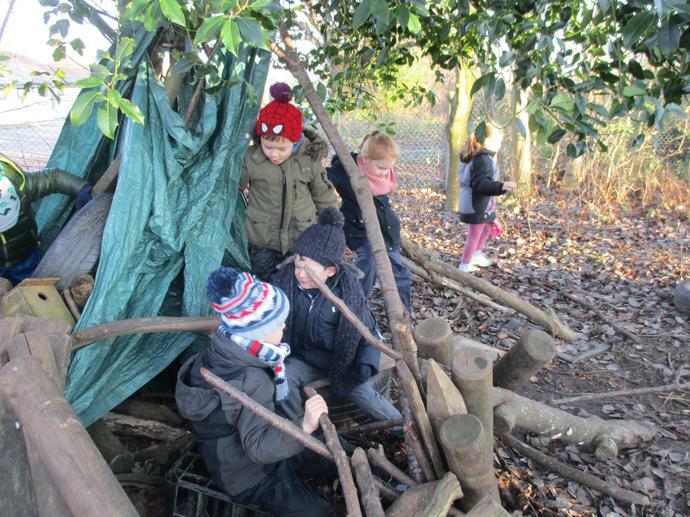 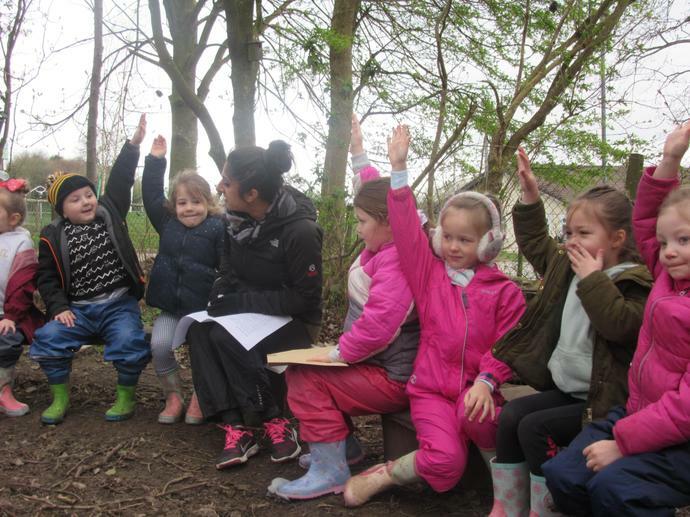 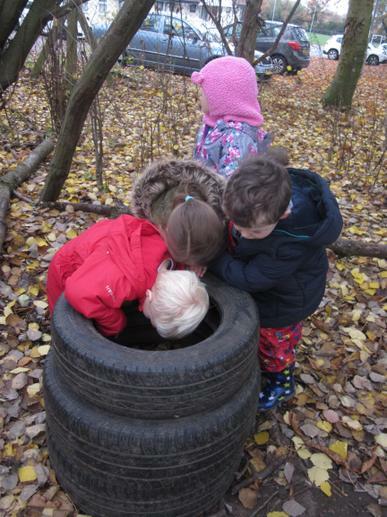 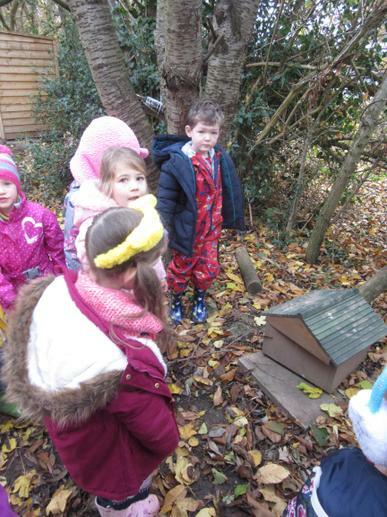 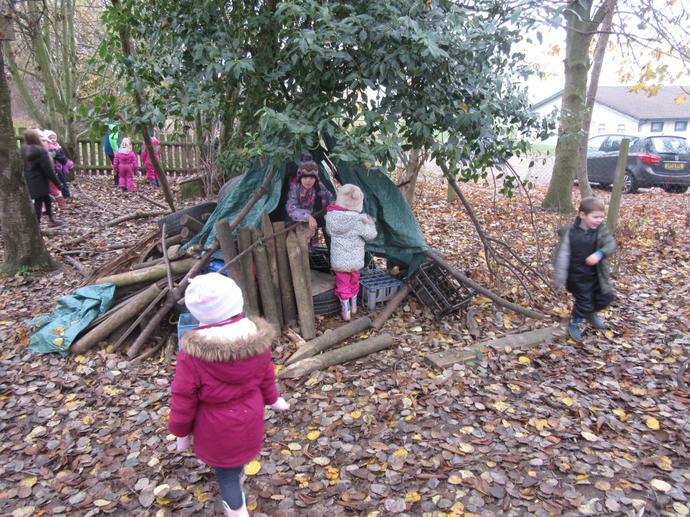 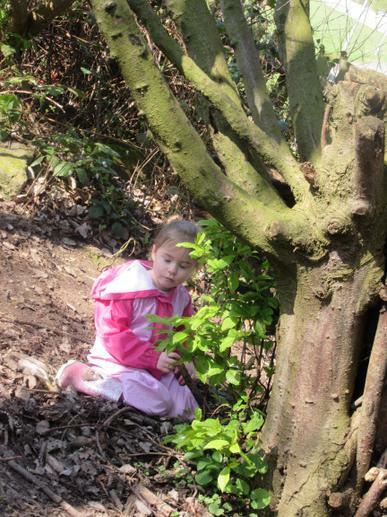 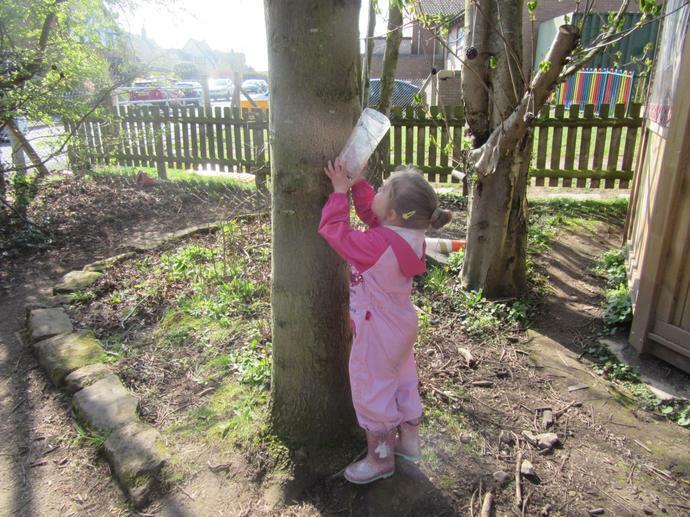 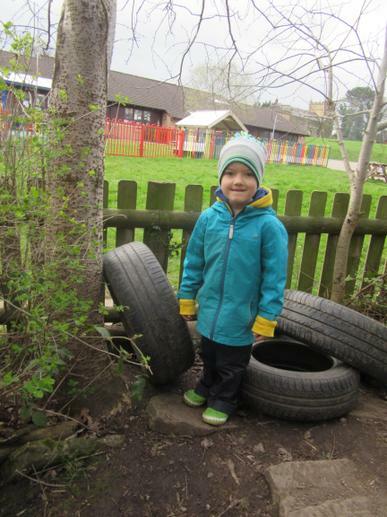 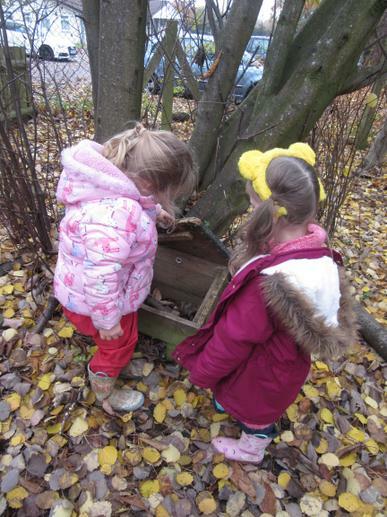 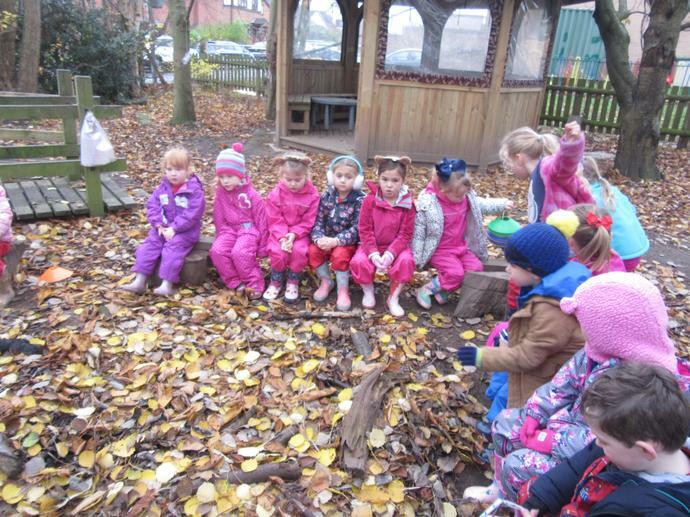 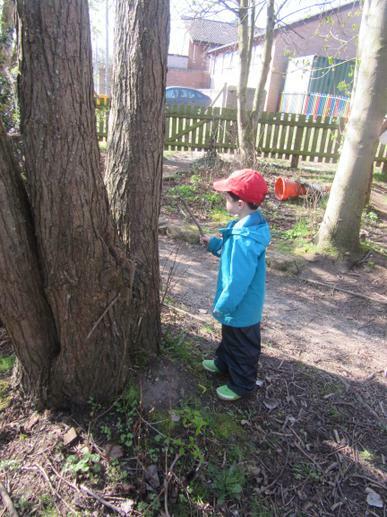 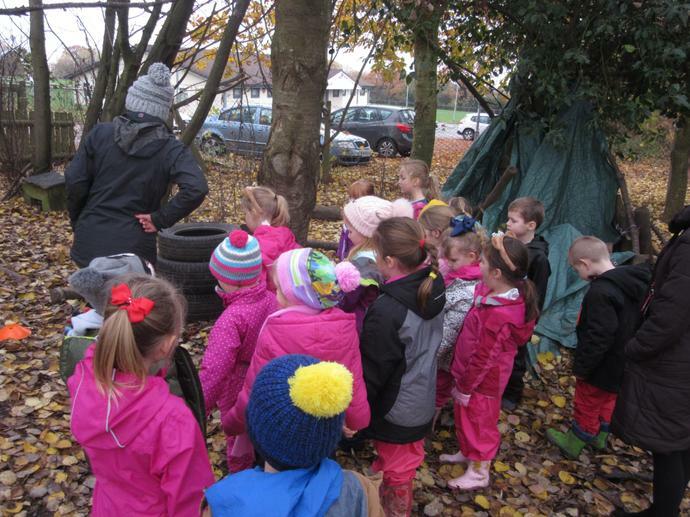 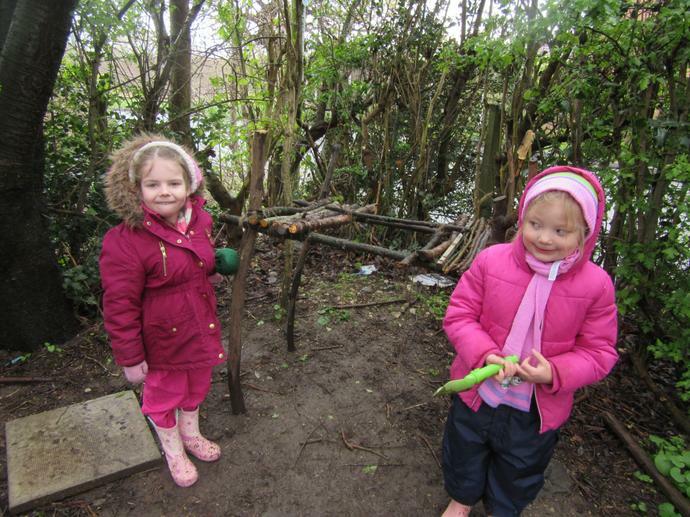 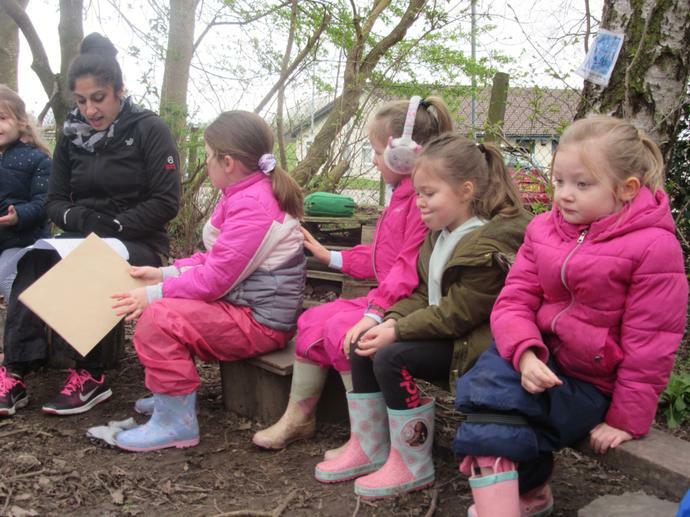 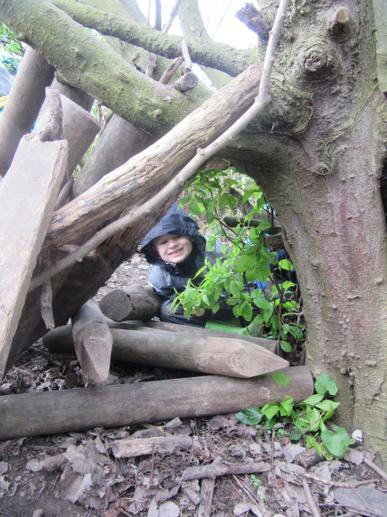 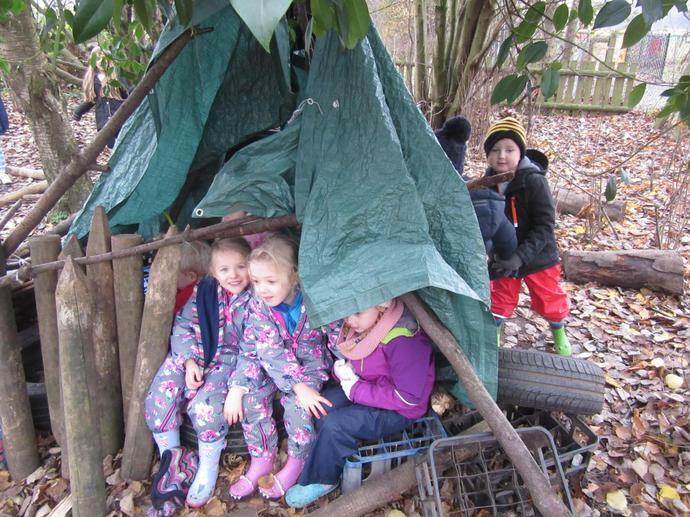 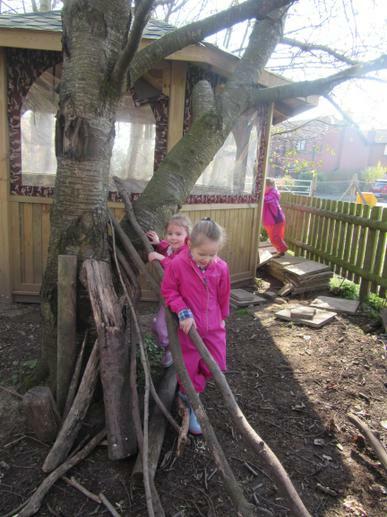 This half term Reception have been busy exploring in the forest through our 'Great Growing' topic. 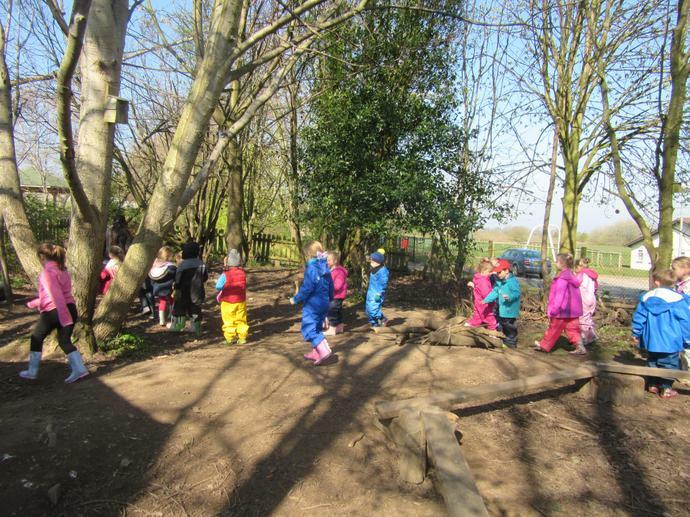 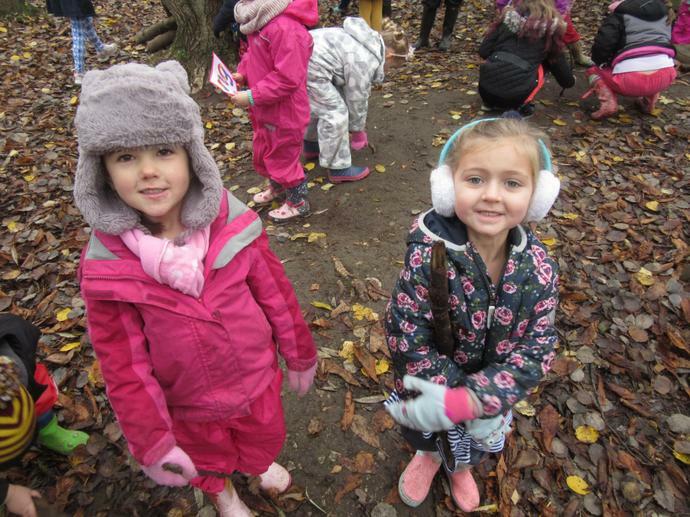 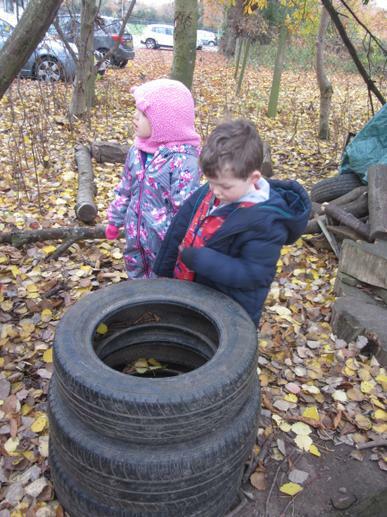 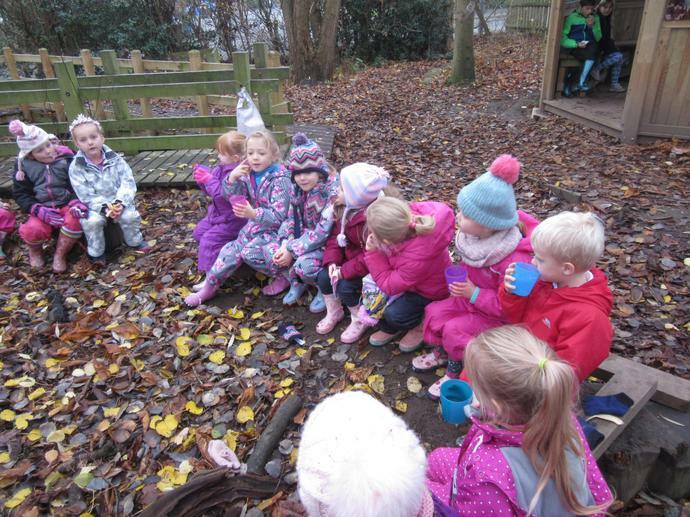 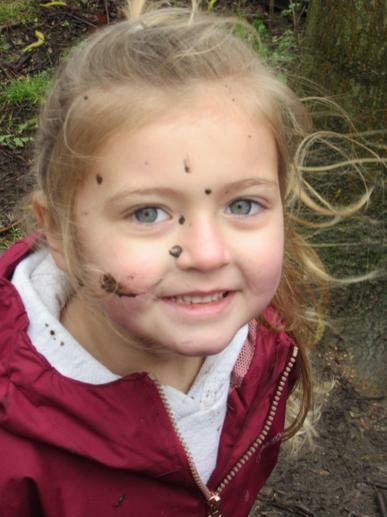 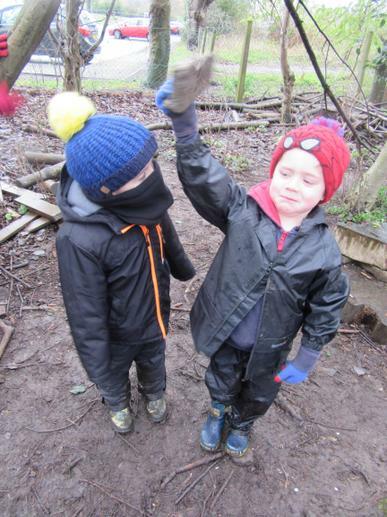 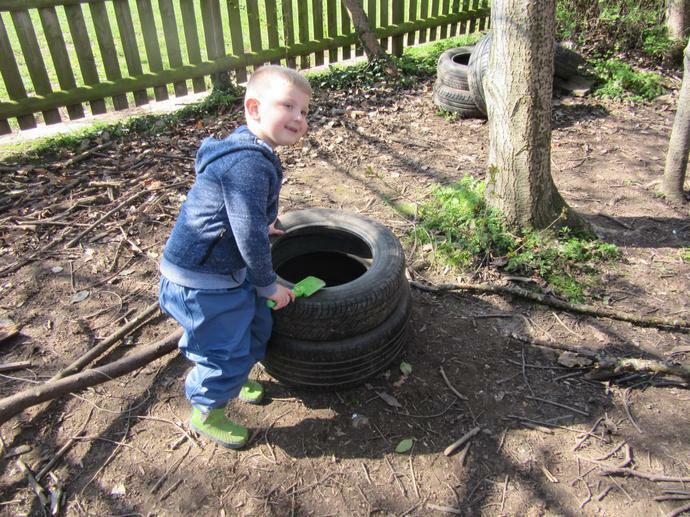 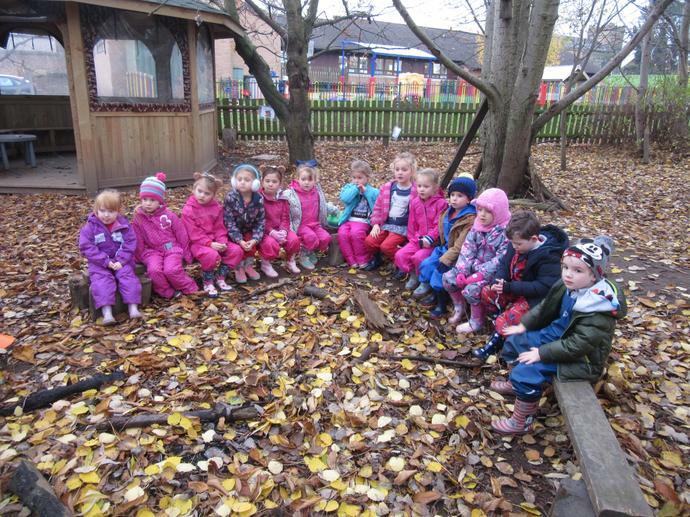 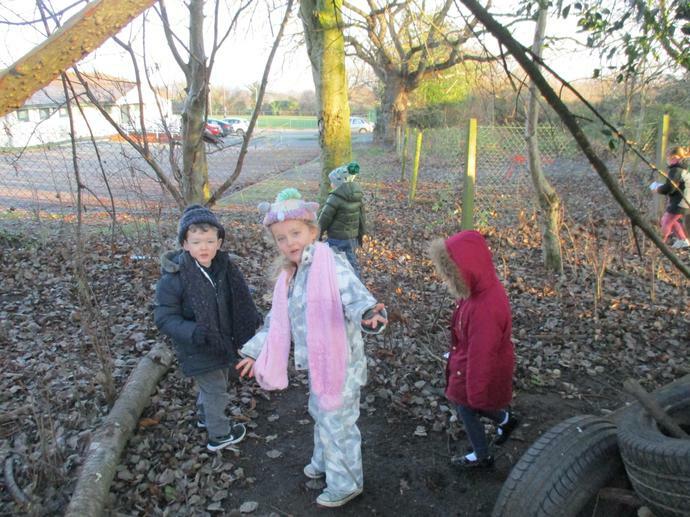 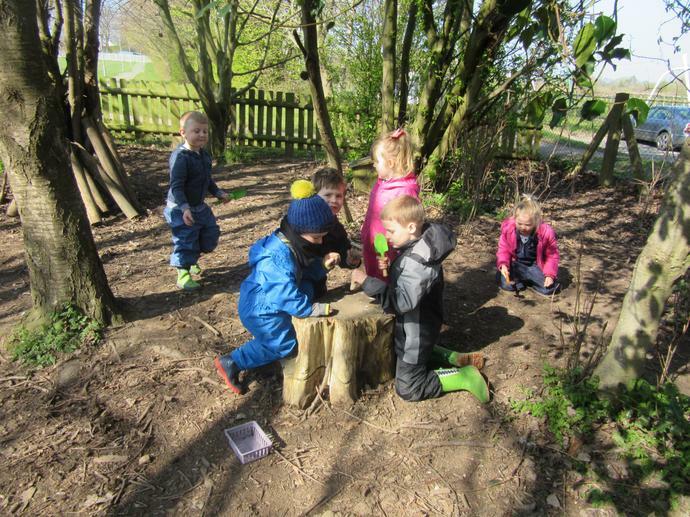 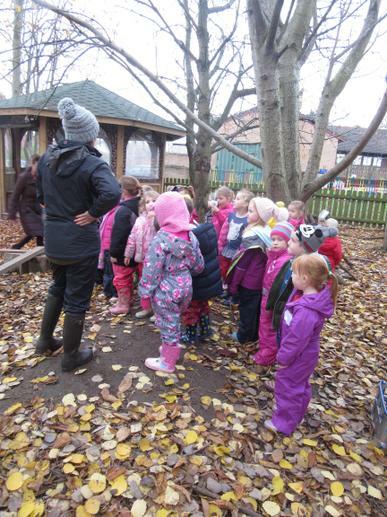 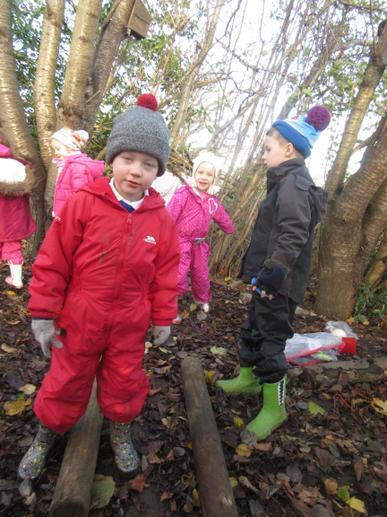 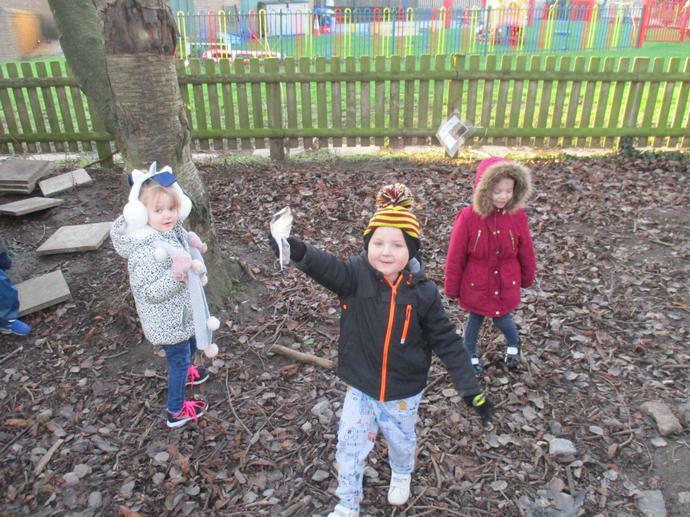 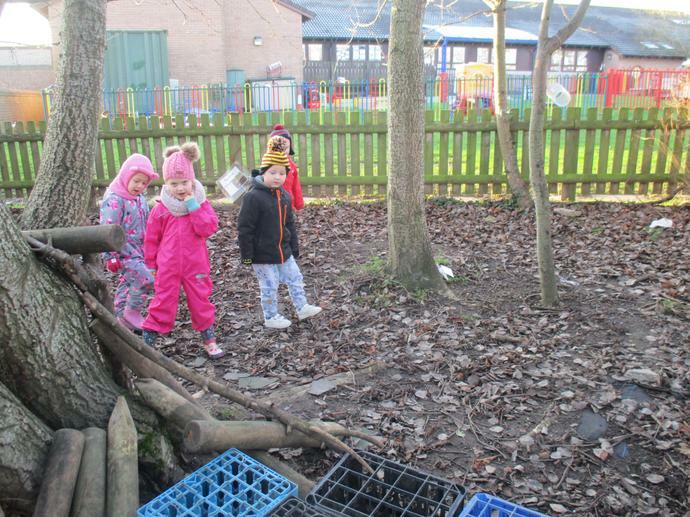 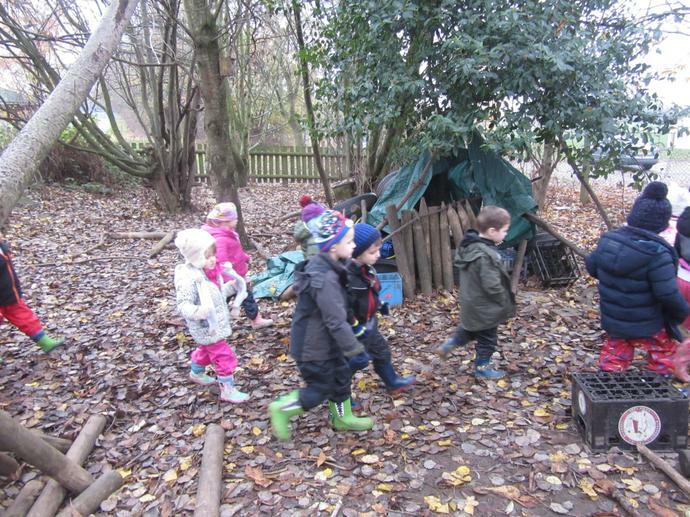 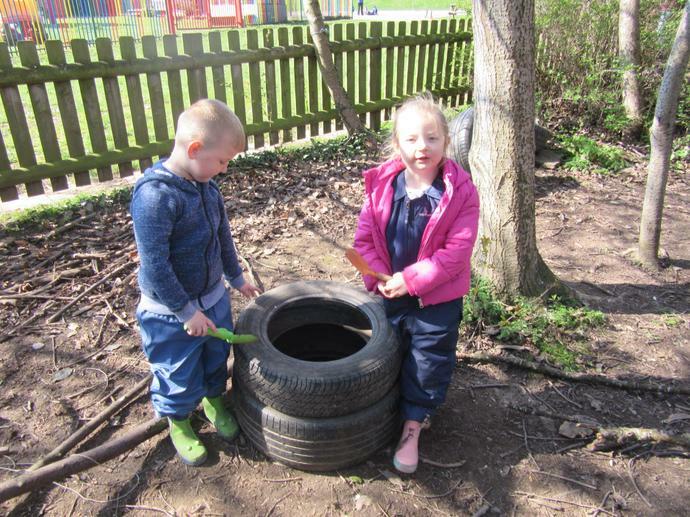 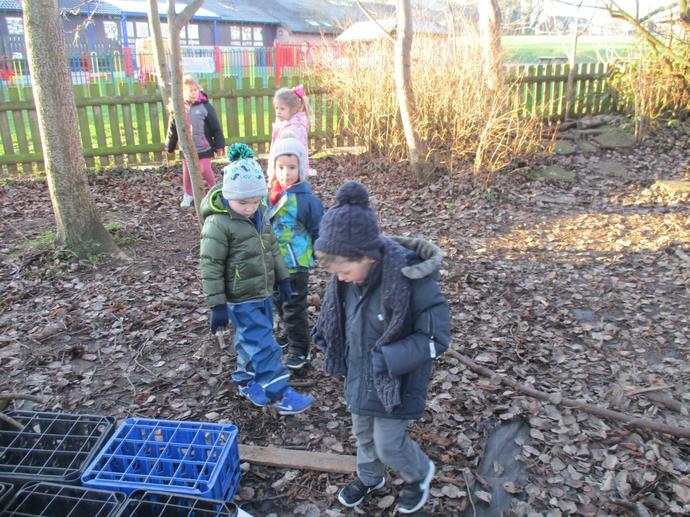 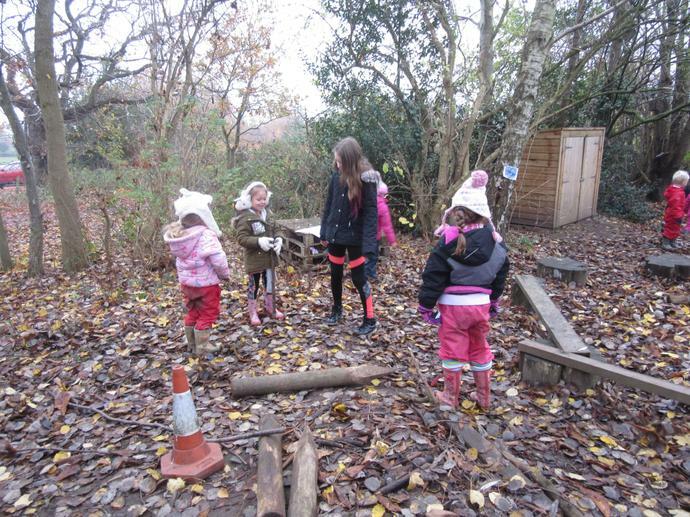 We have measured, sorted heavy and light objects in the forest, counted, made beanstalks and mini sheds and then we enjoyed playing in the mud, making mud monsters. 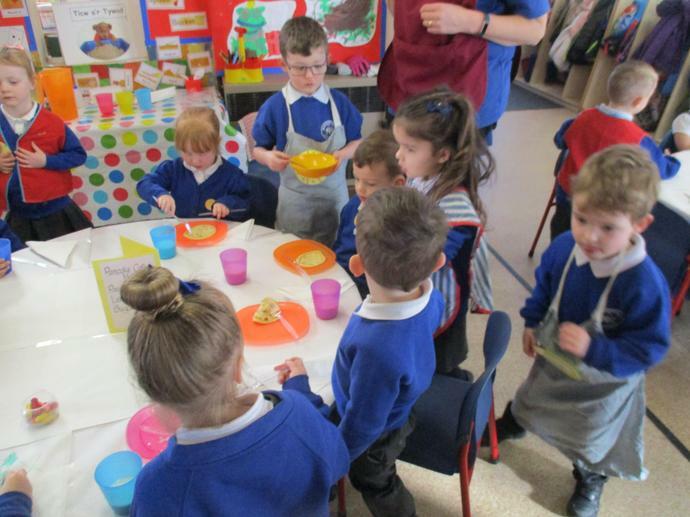 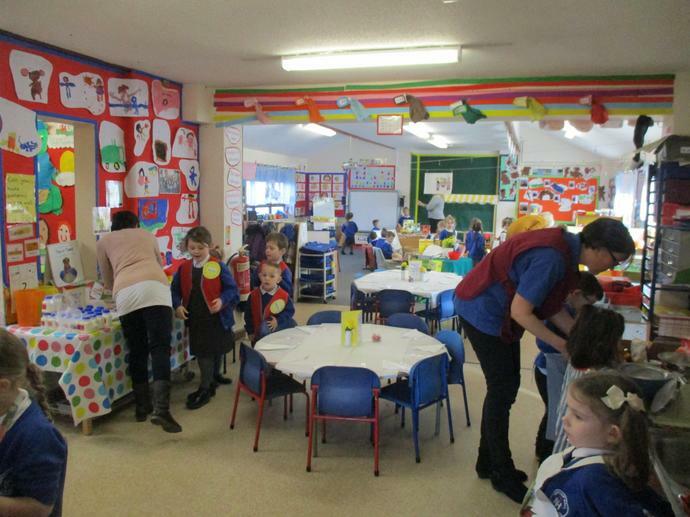 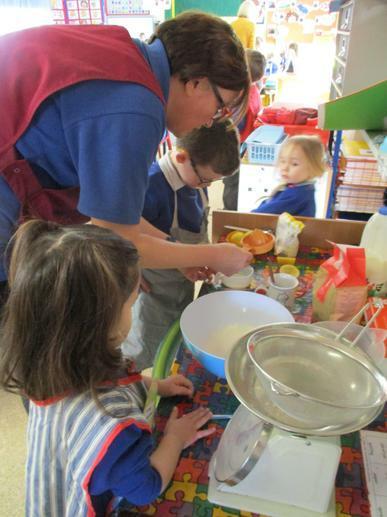 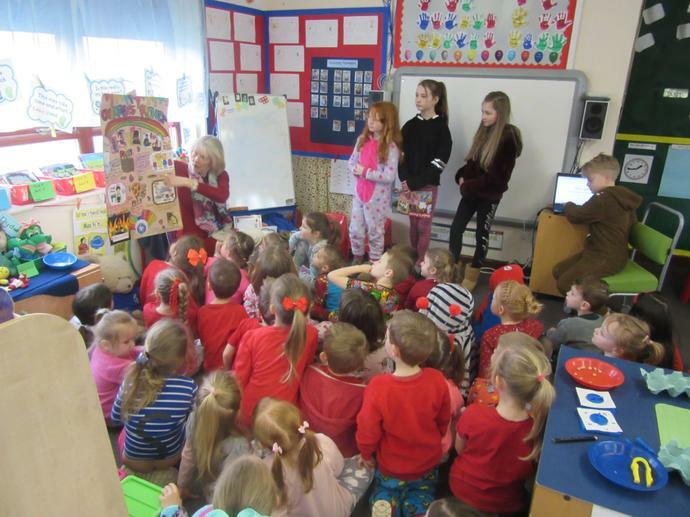 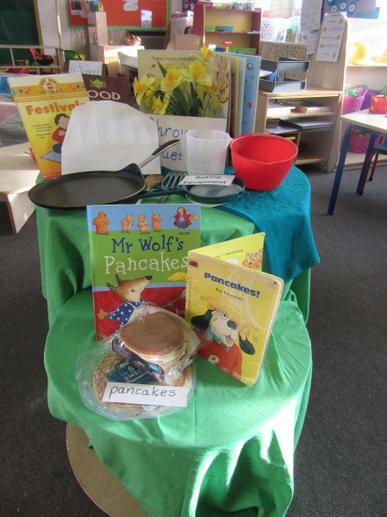 Reception have been busy celebrating Pancake Cafe,World Book Day and Red Nose Day.We hope you enjoy seeing them busy. 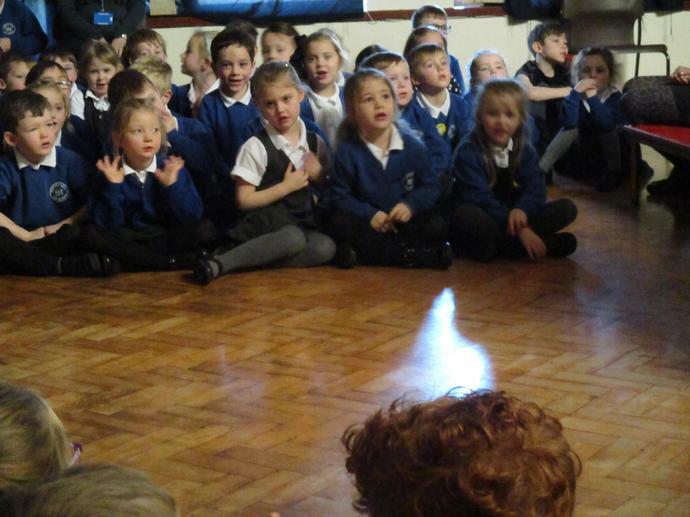 Reception have been busy putting together their performance of 'Born in Bethlehem' for you. 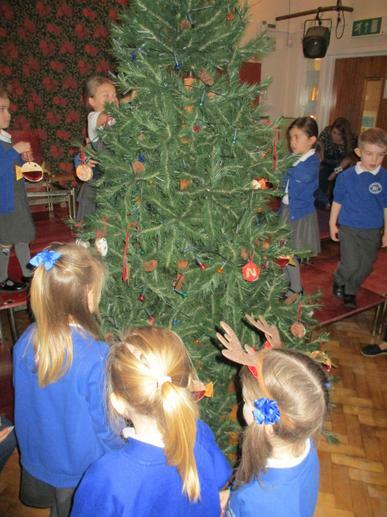 We hope you have enjoyed watching them and we wish you a very 'Merry Christmas' from all of the Reception staff. 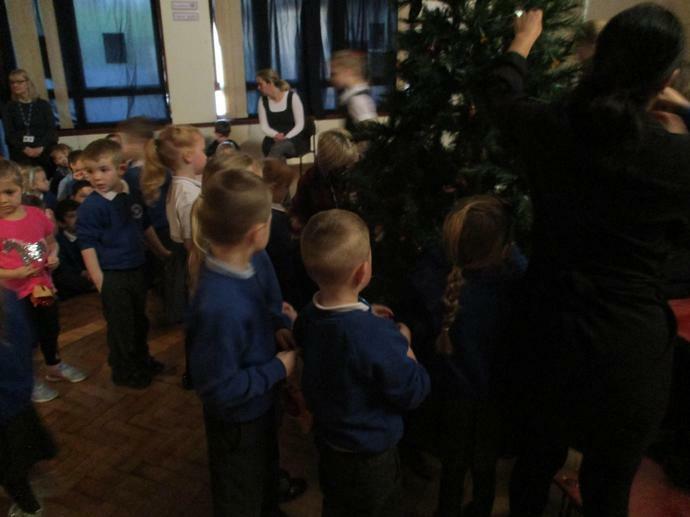 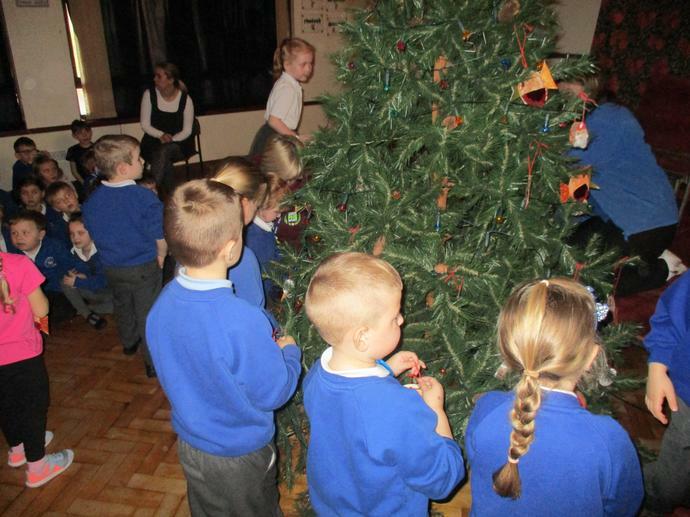 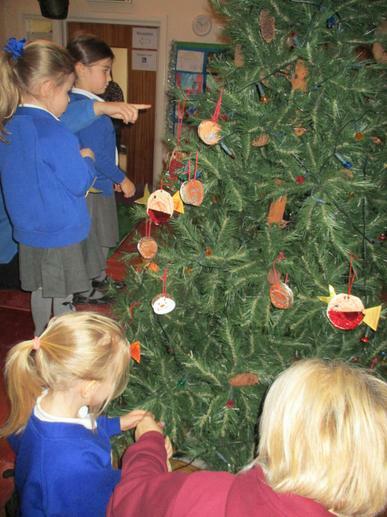 Reception children enjoyed putting their Christmas tree decoration on our school tree. 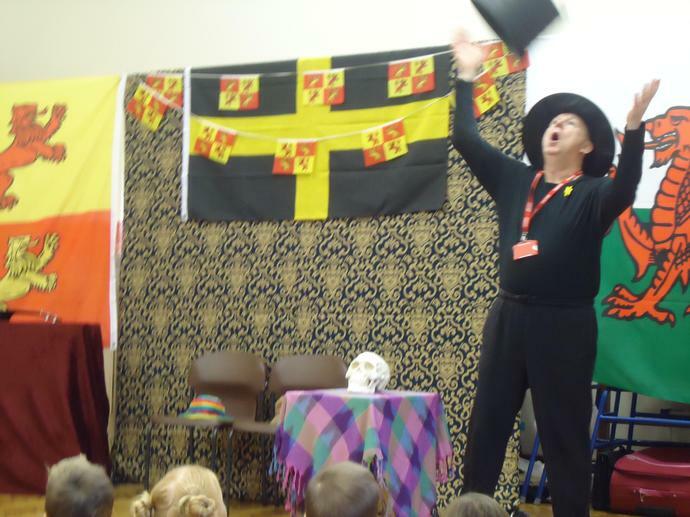 It was a magical experience! 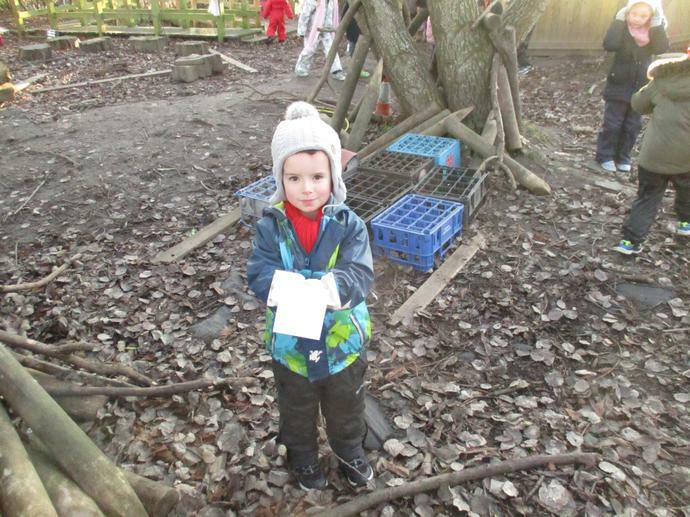 Week 4 - This morning we found a letter in the reading area, it was a letter from Father Christmas! 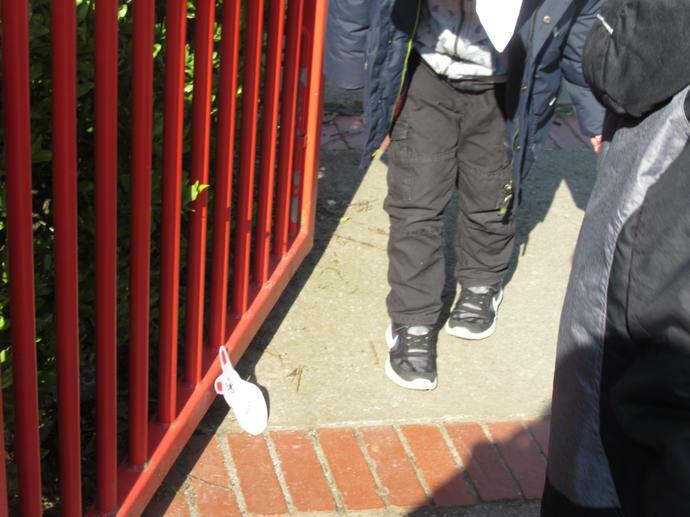 He told us that he had lost our gifts that Mrs Ahmad had given him to deliver. 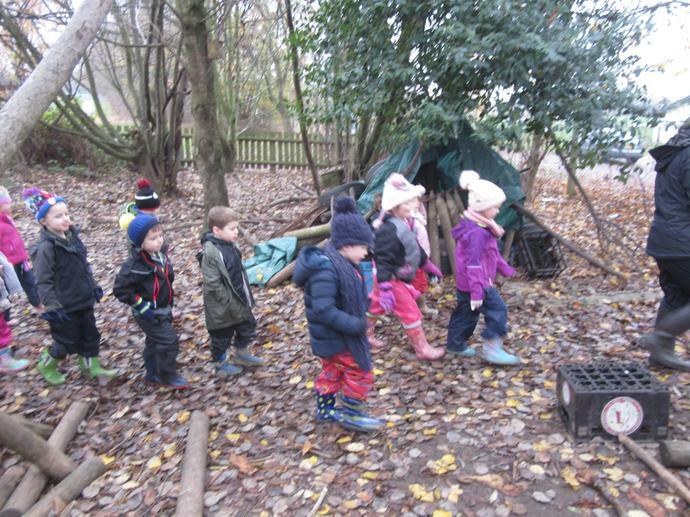 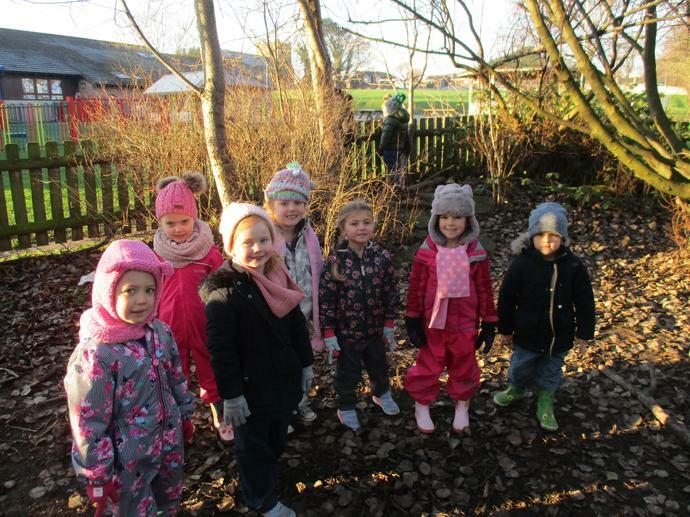 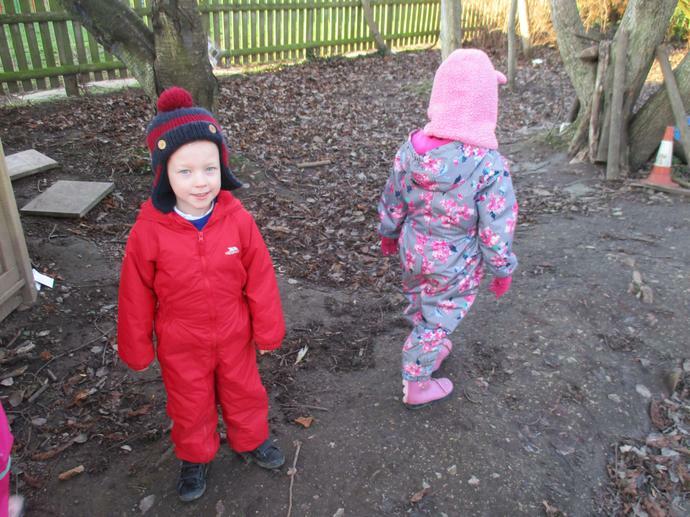 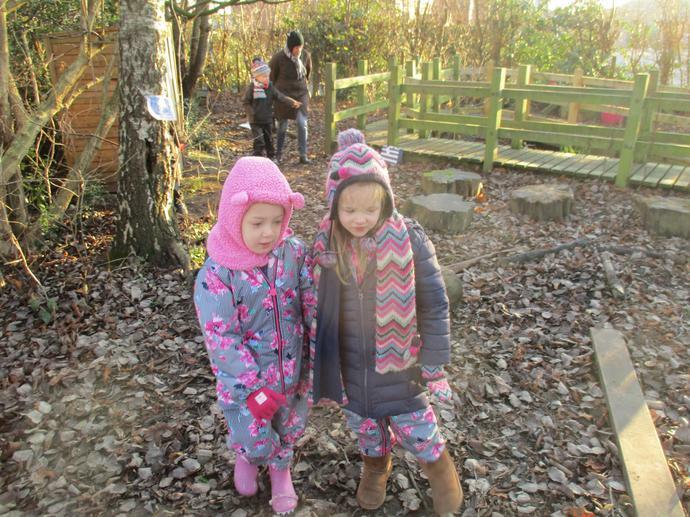 We all wrapped up warm and made our way down to the forest. 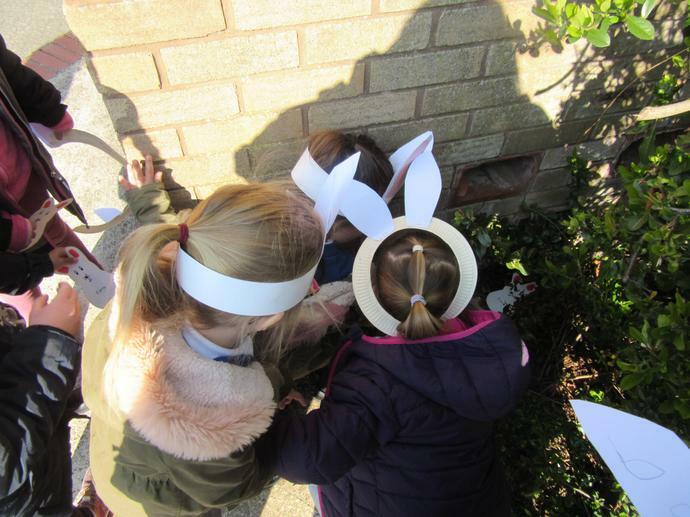 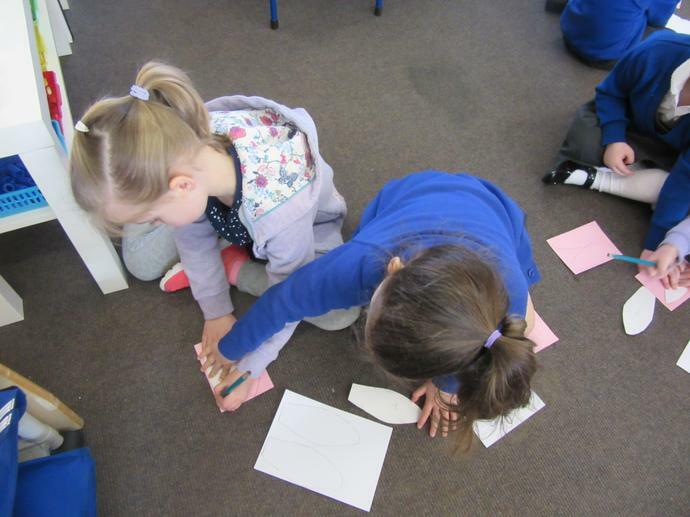 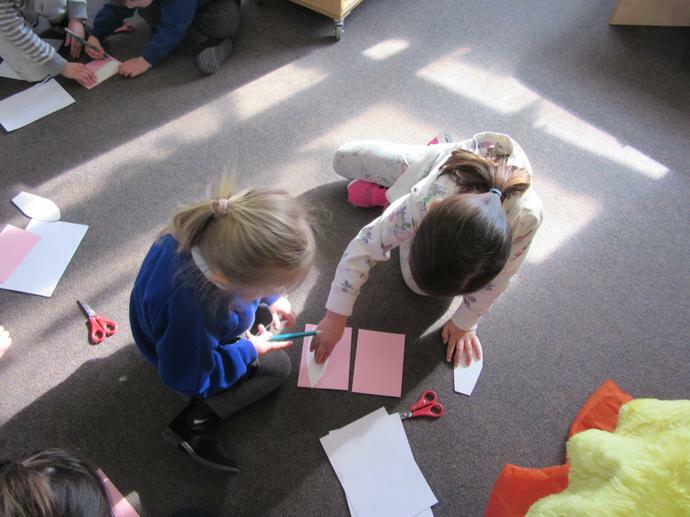 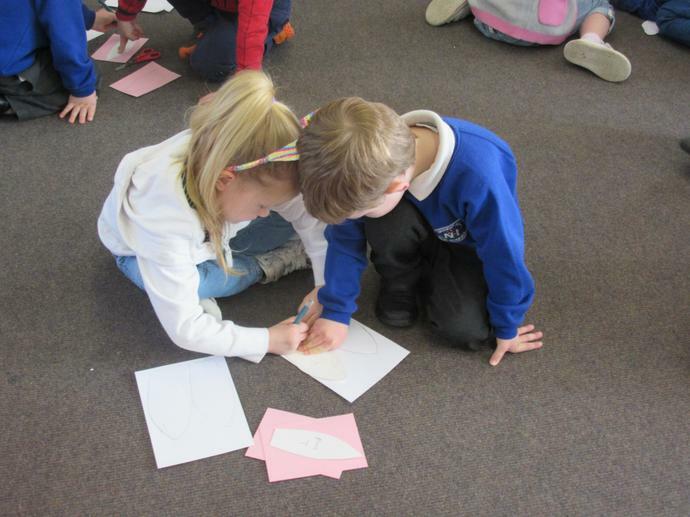 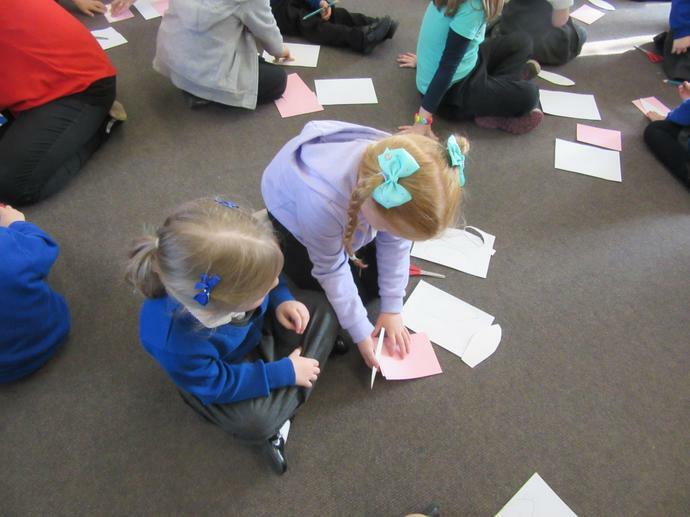 We helped each other to find our hidden gifts, we really enjoyed doing this! 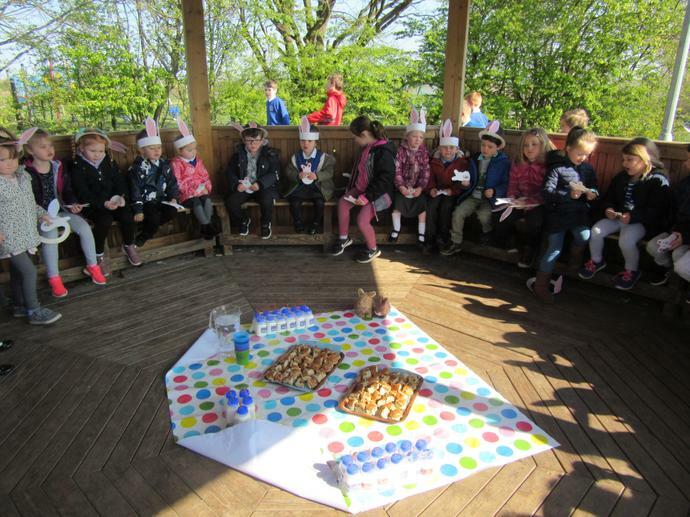 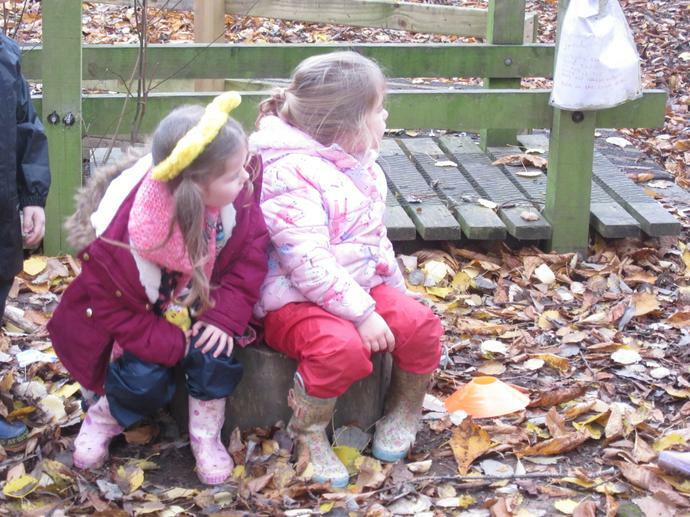 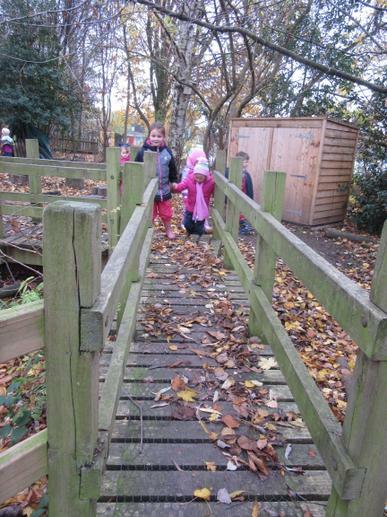 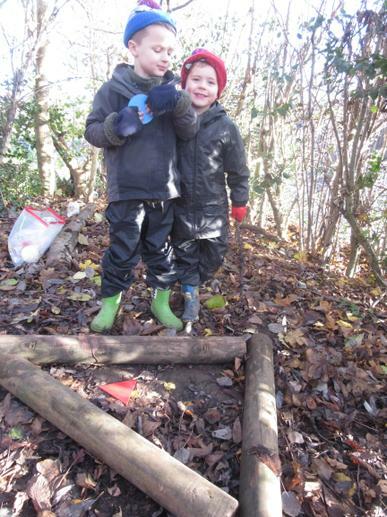 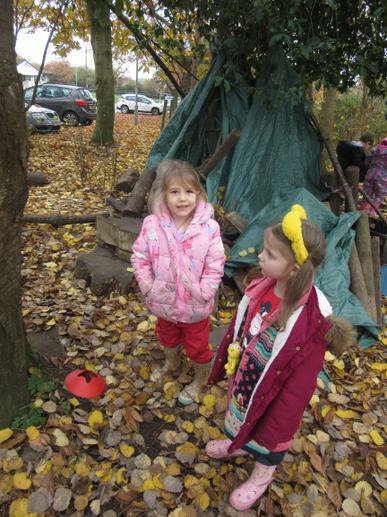 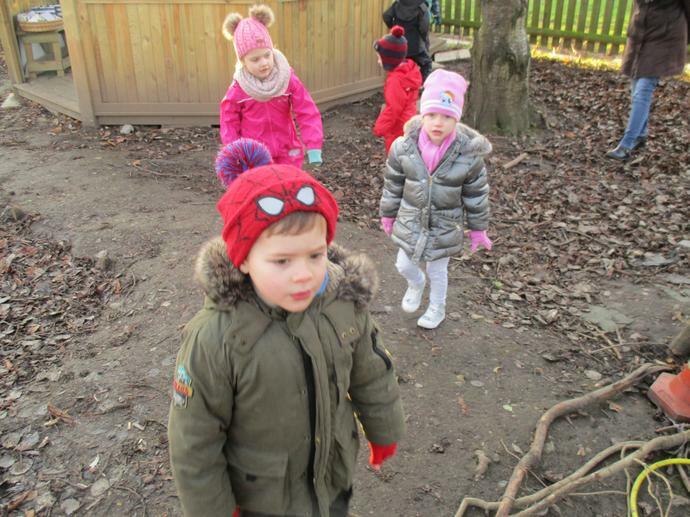 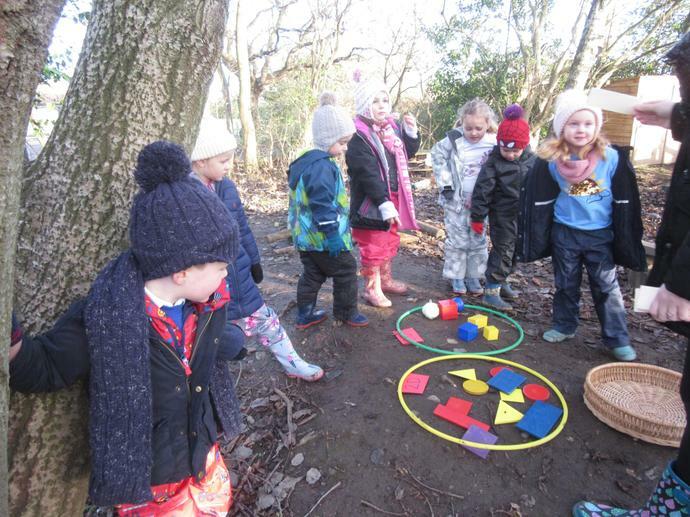 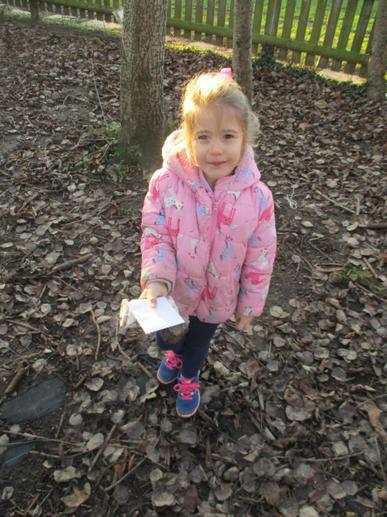 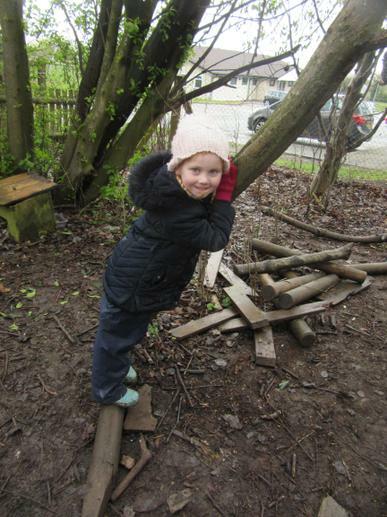 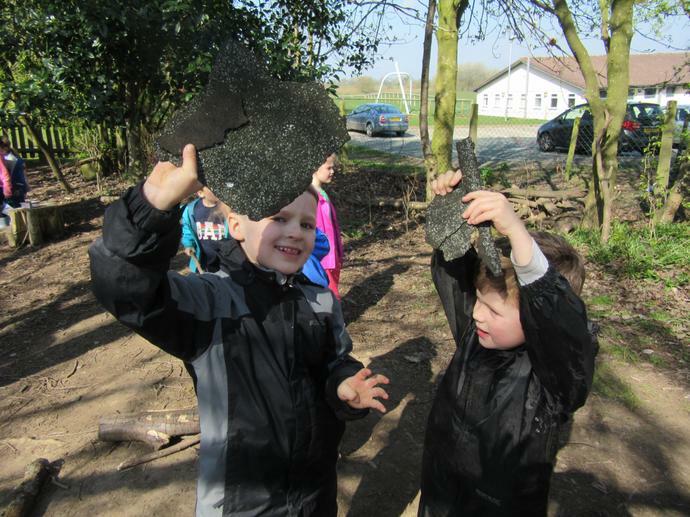 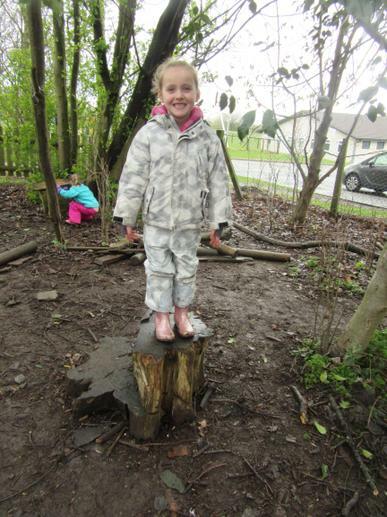 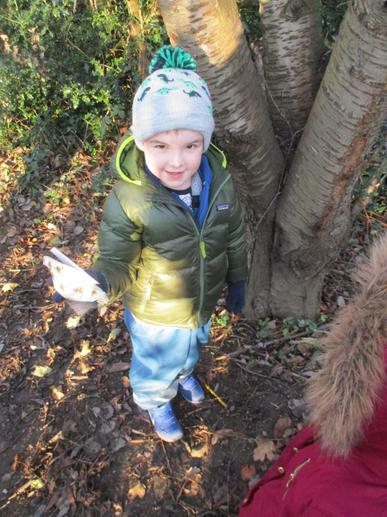 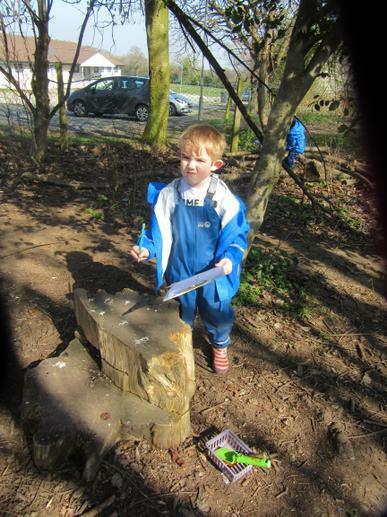 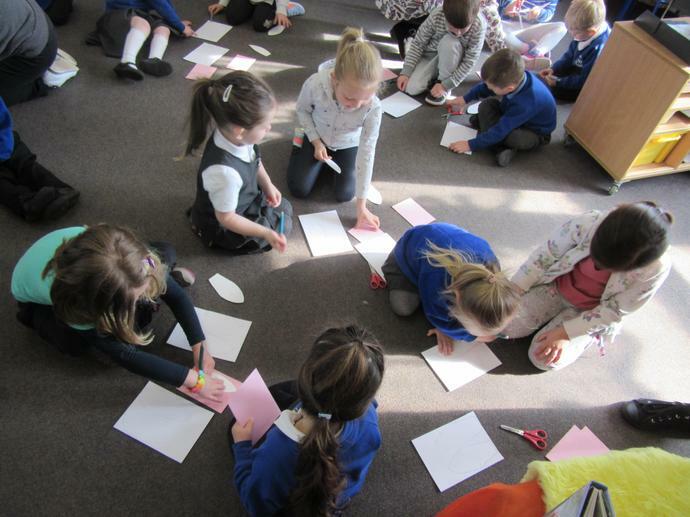 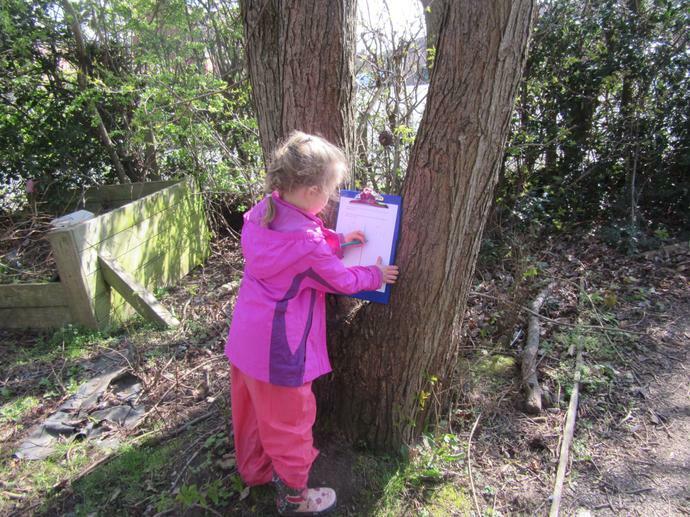 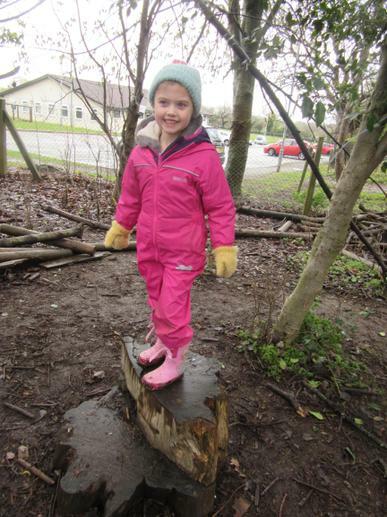 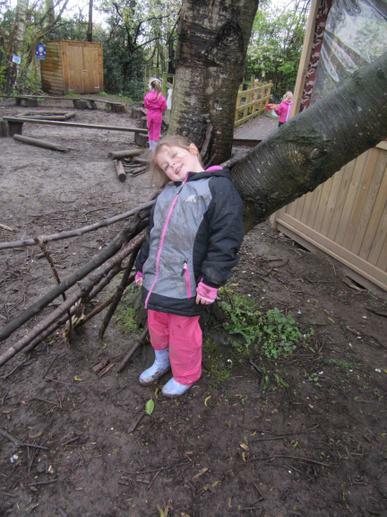 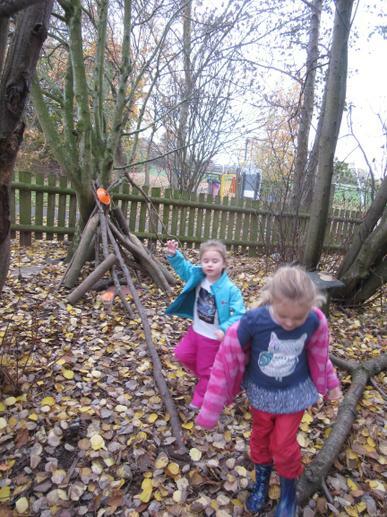 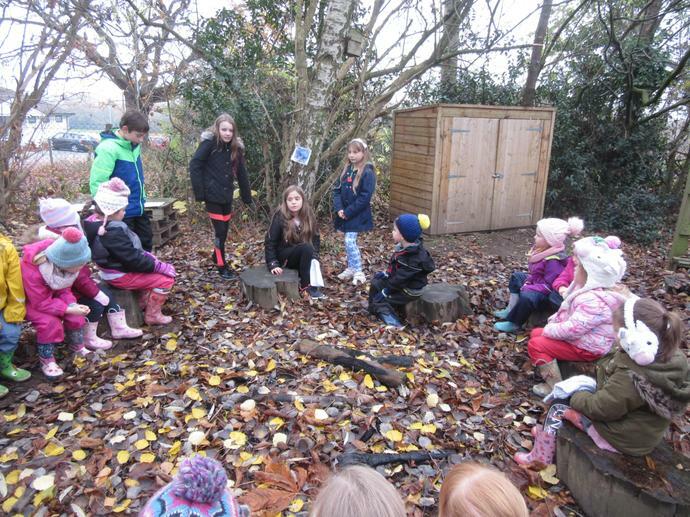 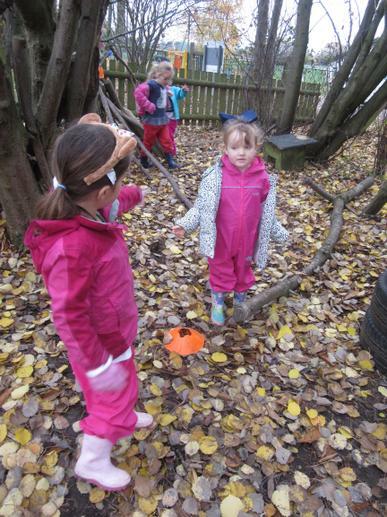 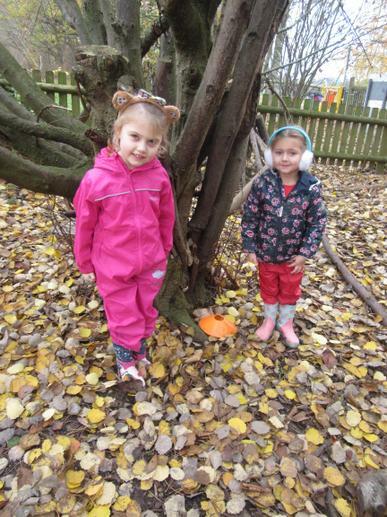 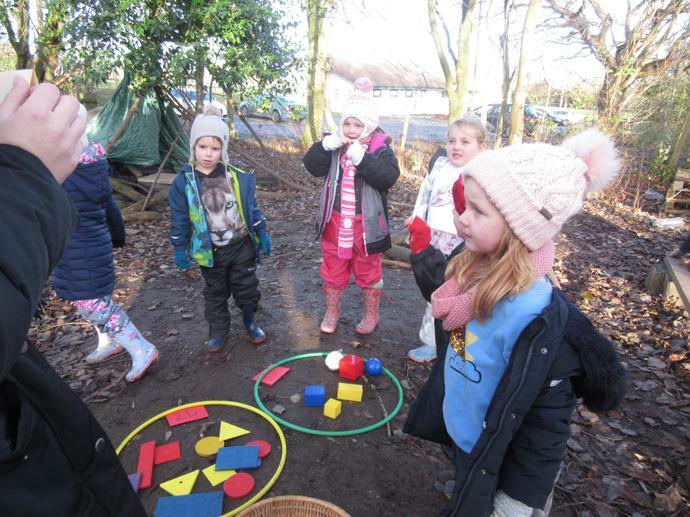 Week 3 - Today the children enjoyed learning about 2D and 3D shapes in the forest. 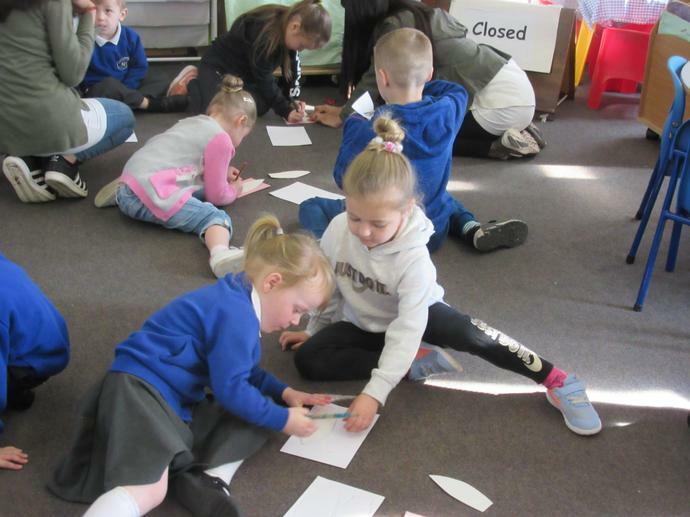 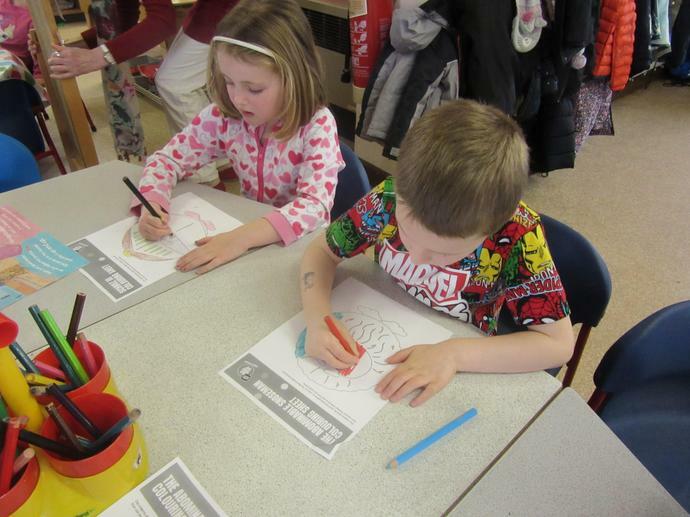 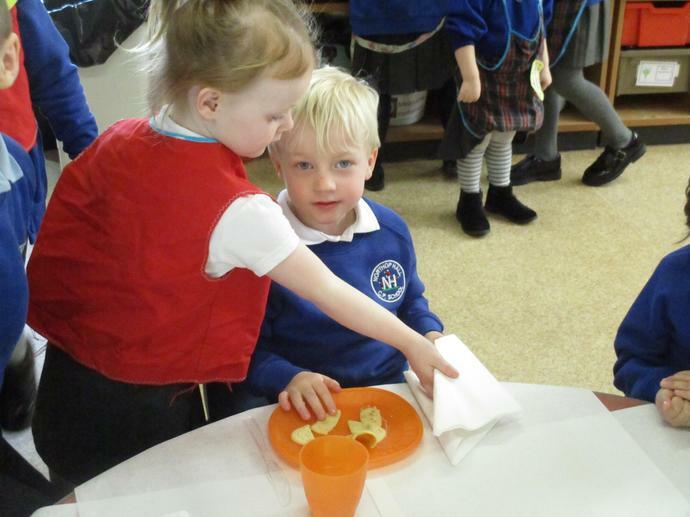 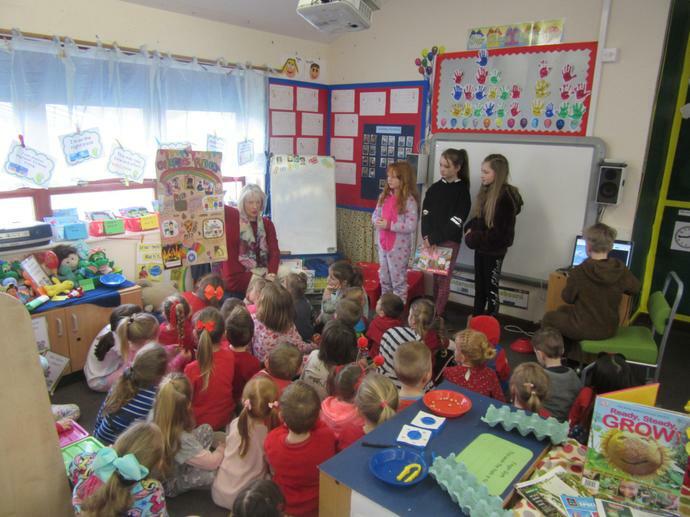 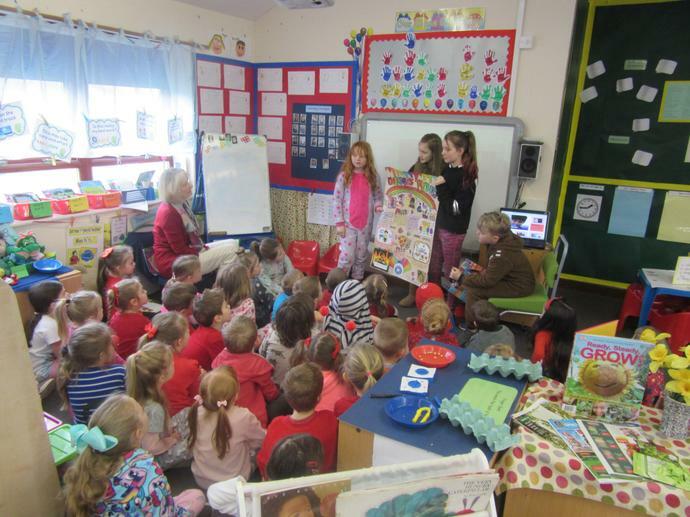 Week 2 - The children were joined by the juniors for National Takeover Day. 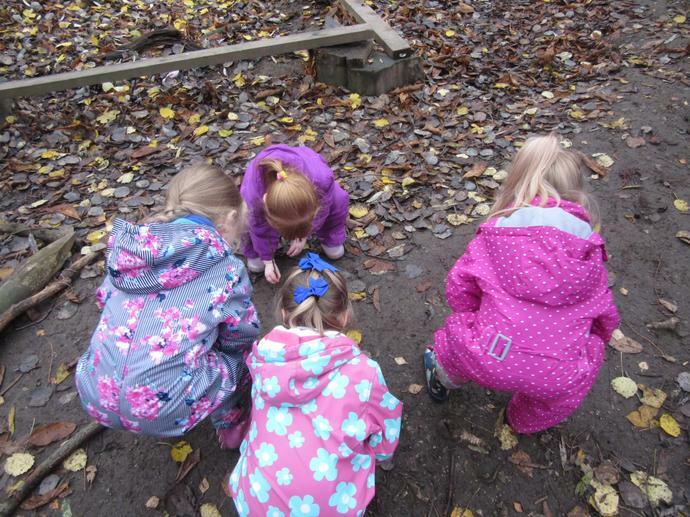 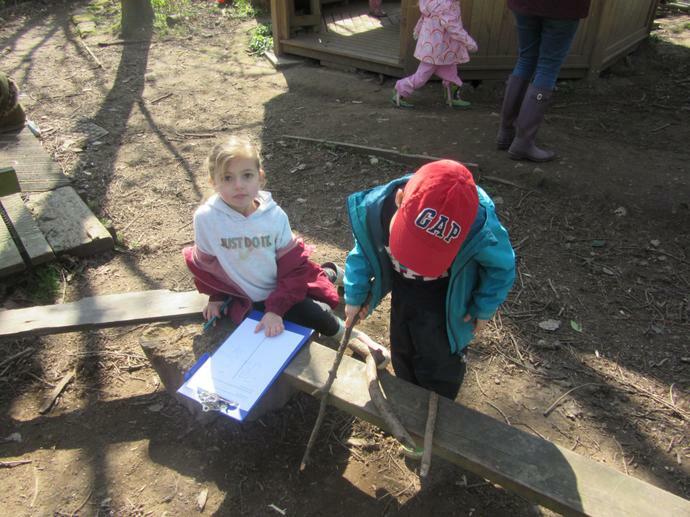 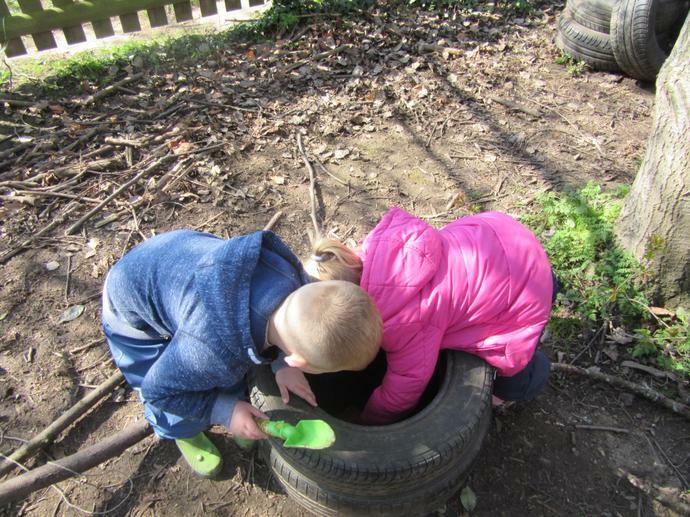 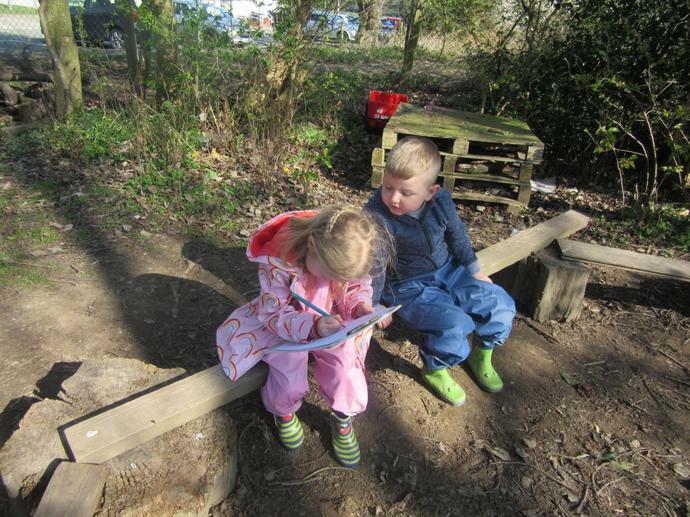 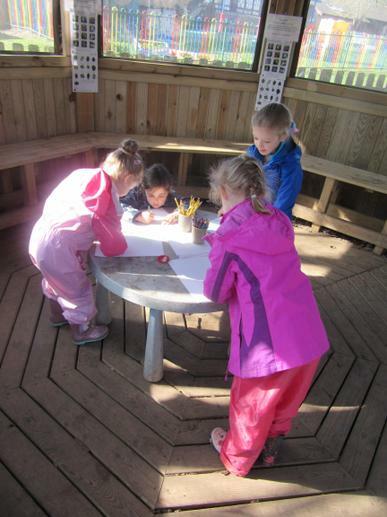 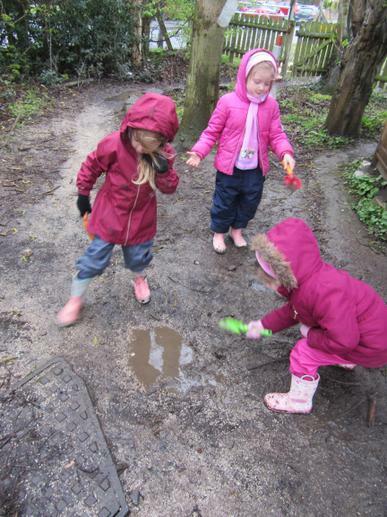 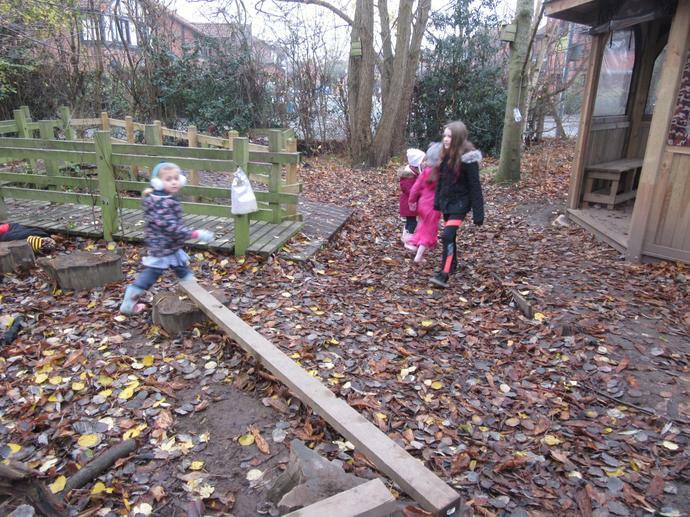 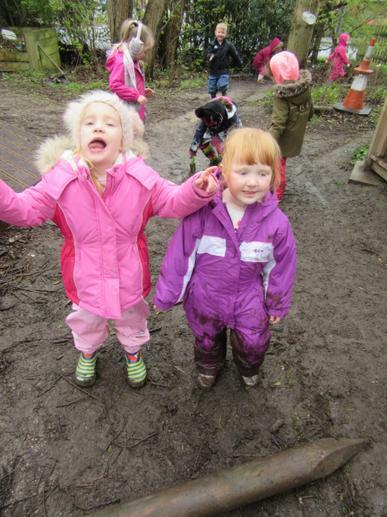 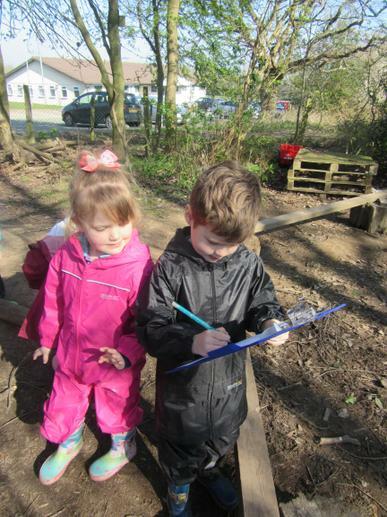 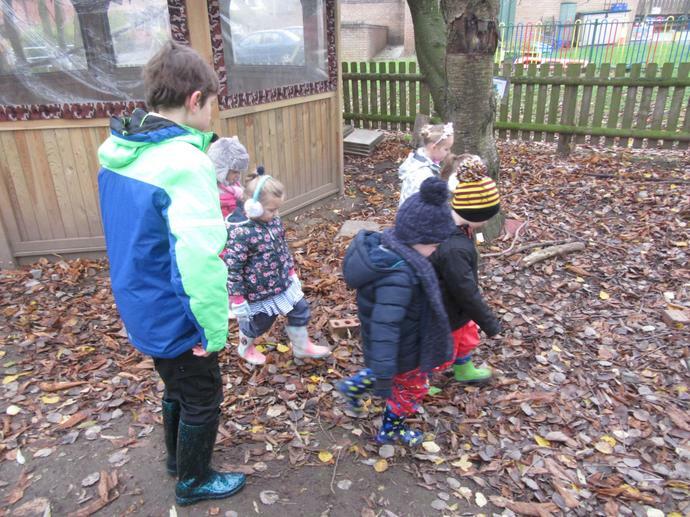 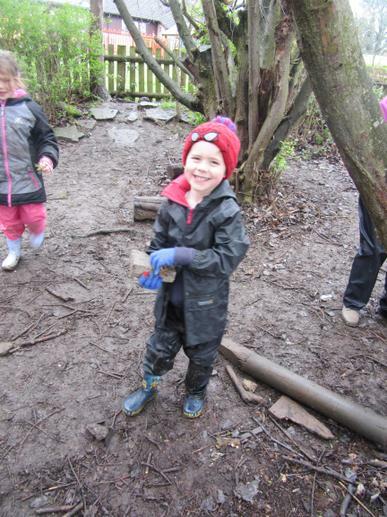 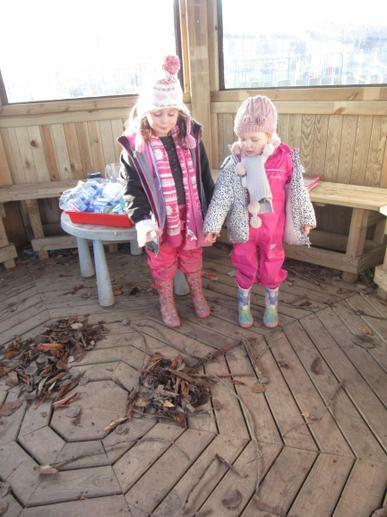 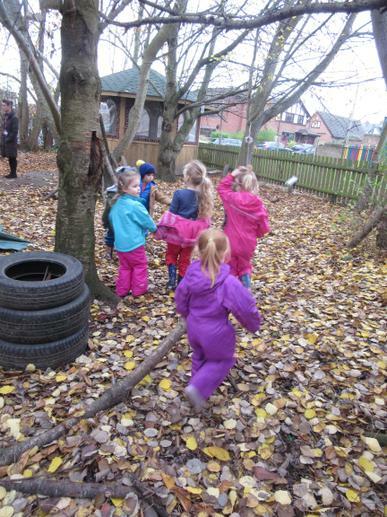 They enjoyed making patterns, playing games, forming names in the ground and going on a sound hunt. 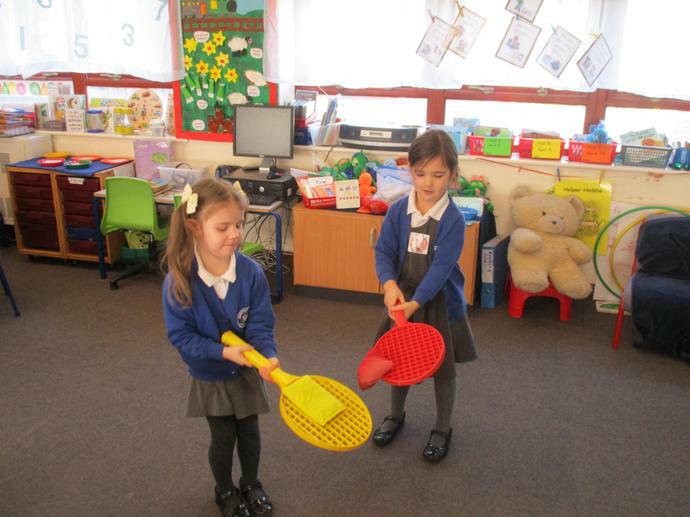 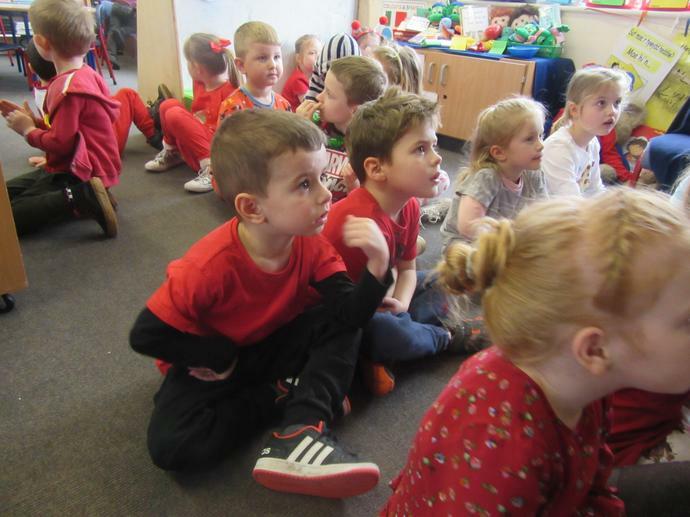 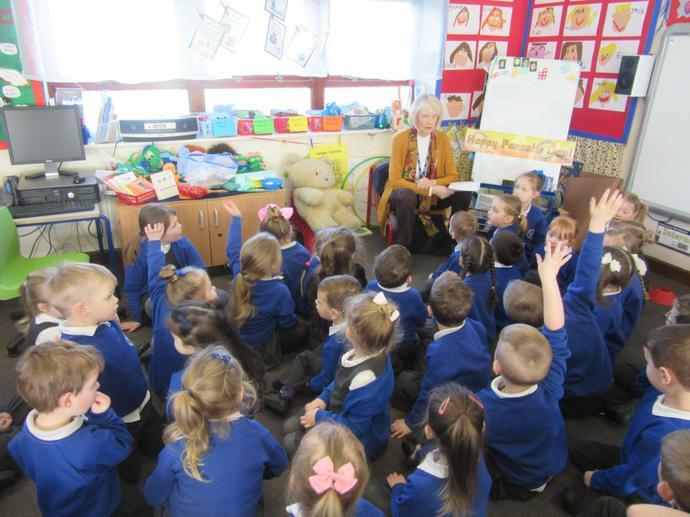 Week 1 - The children enjoyed learning to keeping safe. 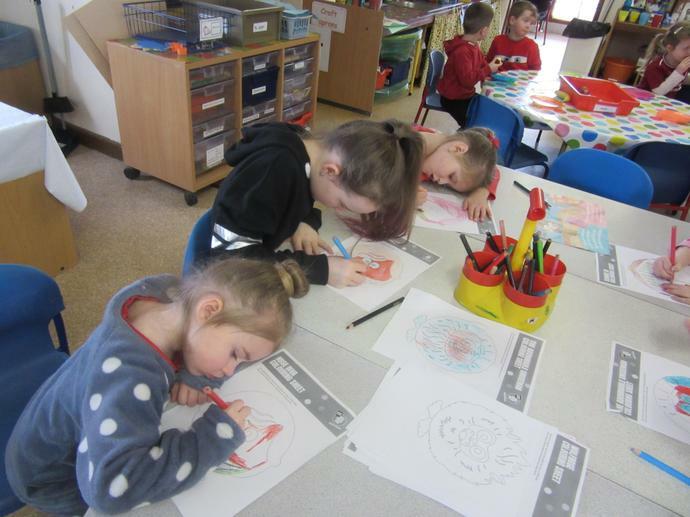 Reception have been busy learning about Wales. 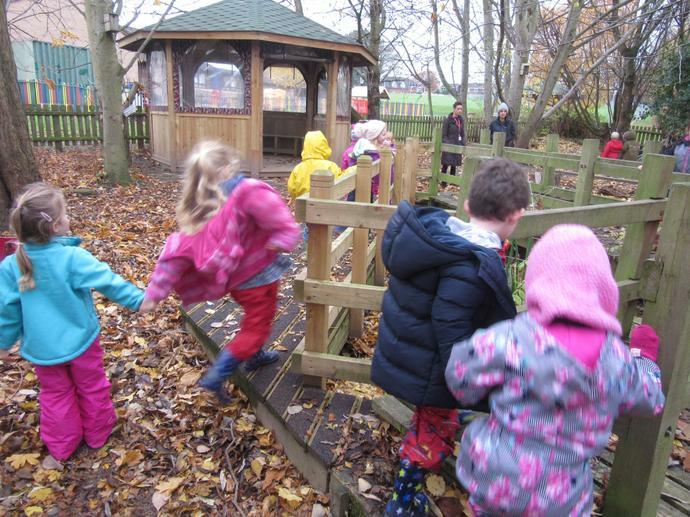 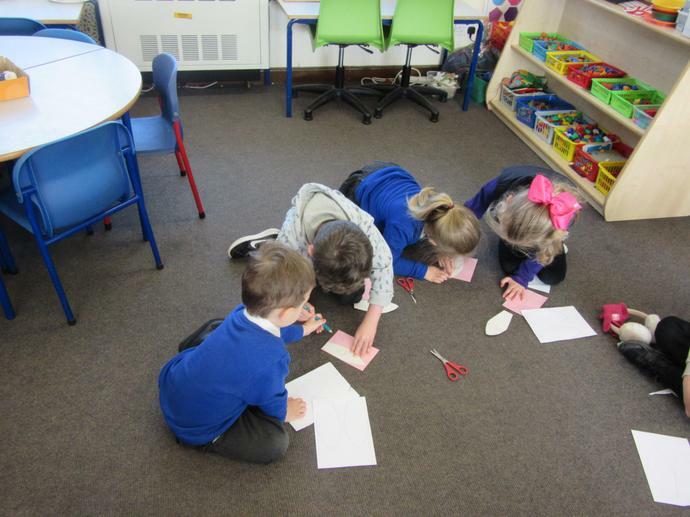 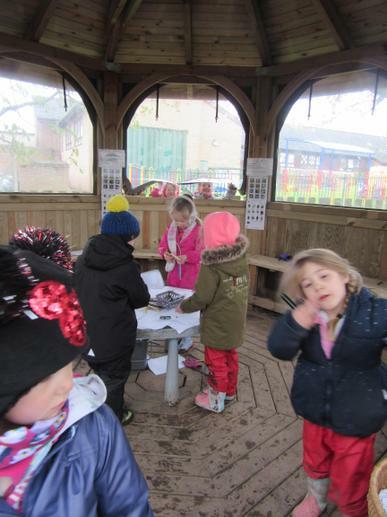 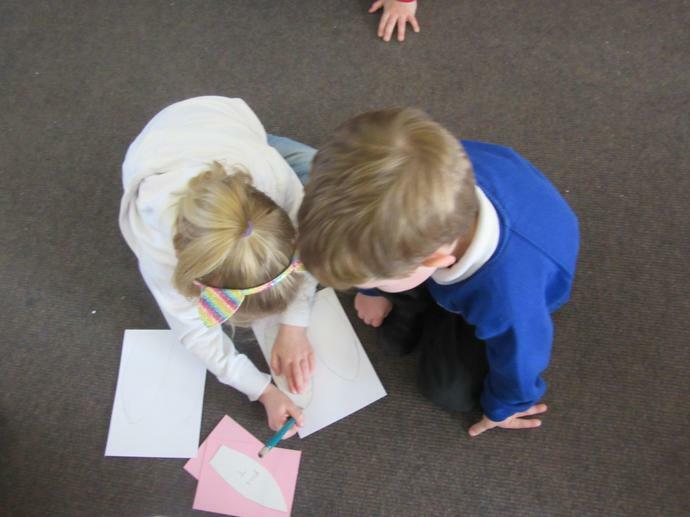 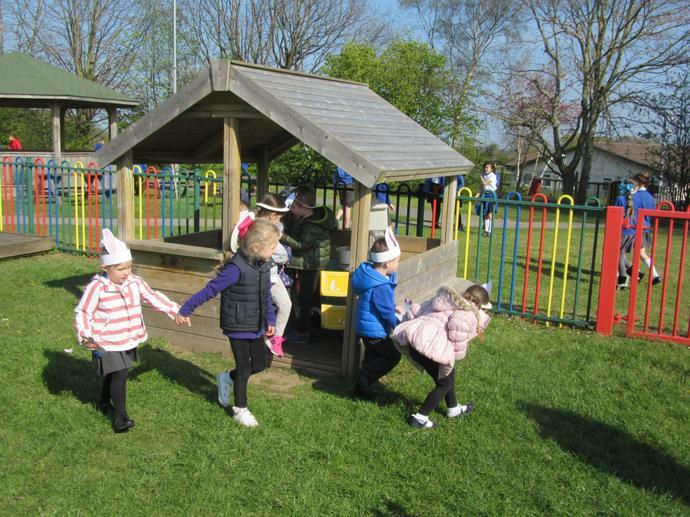 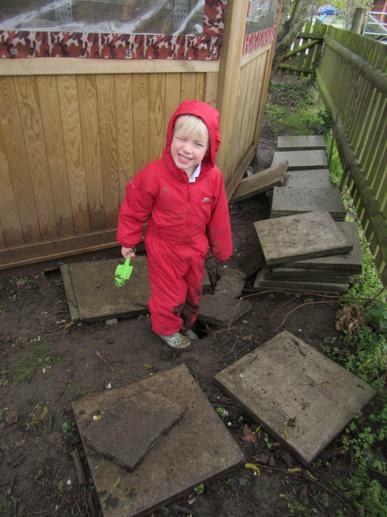 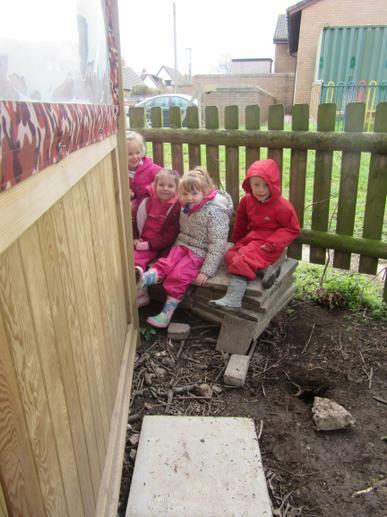 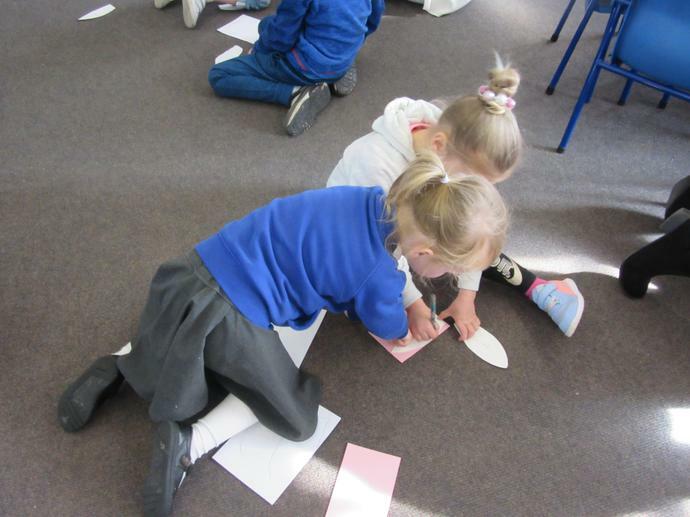 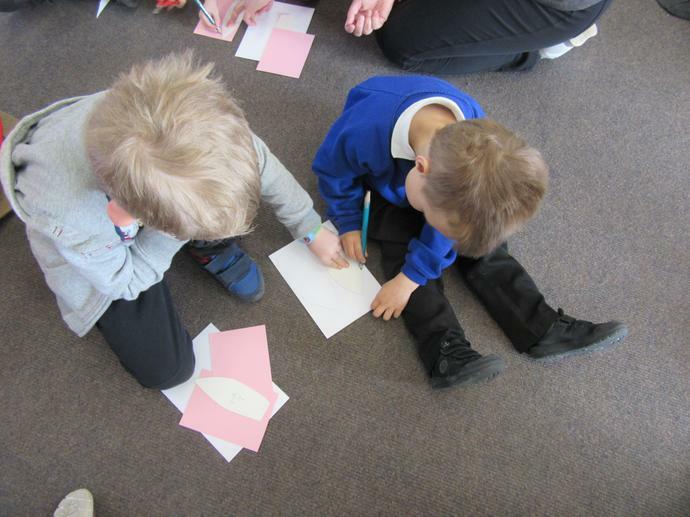 They have worked with Nursery to make castles, daffodils, dragons, flags and planted daffodil bulbs around the school. 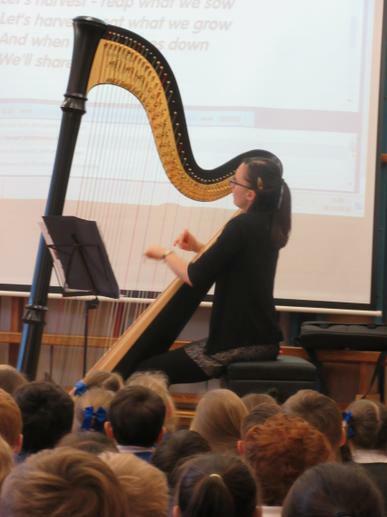 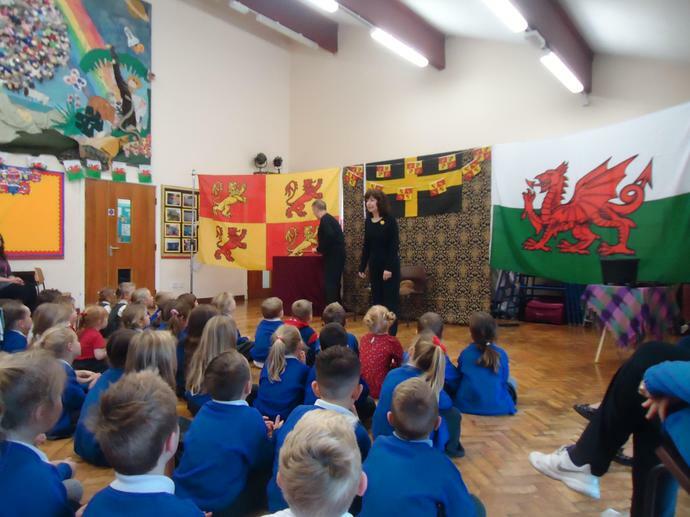 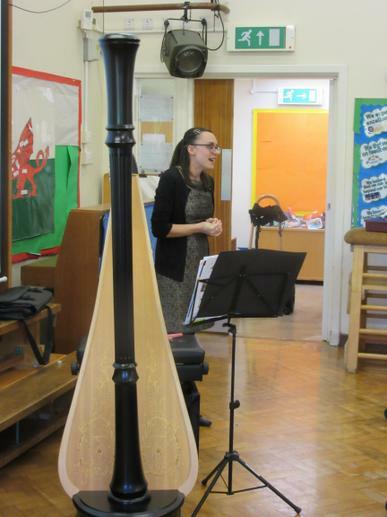 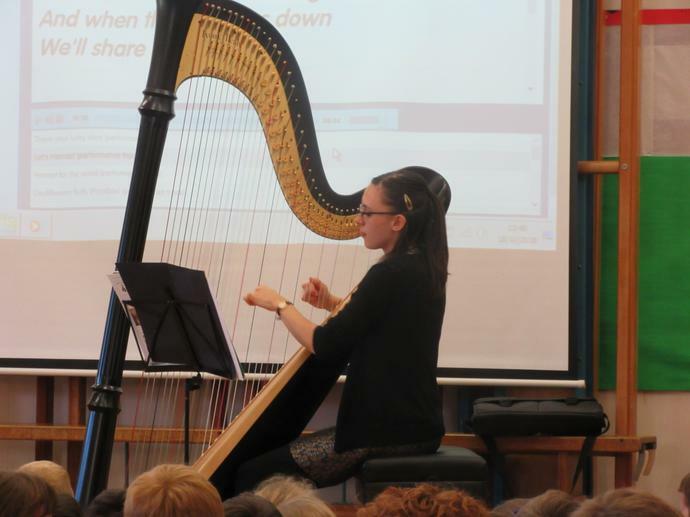 We have had a performance of Tales From Wales and the children were visited by a Welsh Harpist who performed pieces of music for them. 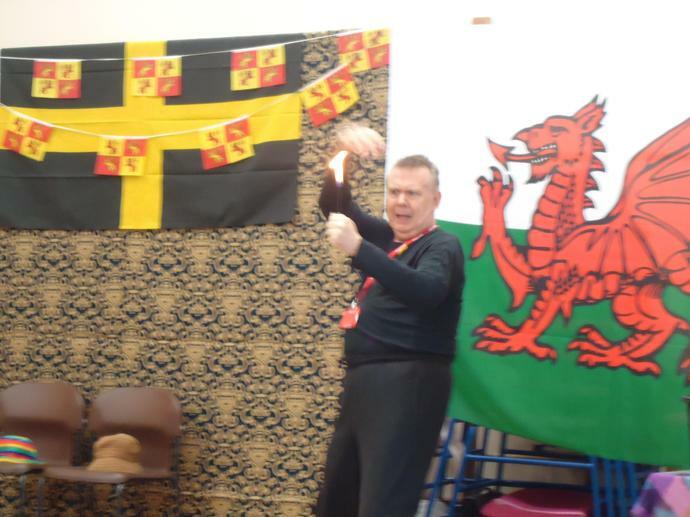 The children even did a bit of Welsh dancing and tried some bara brith.